Not all the people listed below succeeded in getting to the summit though happily many did, but all have agreed to be contacted by potential future clients looking for a different perspective on our courses. Just use the email address at the bottom of each listing it you would like to do this. As a company we are extremely proud of this page and very much appreciate the time taken by those who have contributed to it. As the only company exclusively offering guided Mont Blanc trips I would expect them to have every base more than covered and they did, from start to finish every detail had been thought of, planned and prepared for. The hearty welcome snacks were superb, especially my gluten-free oatcakes which were the best ever, and also by request provided on our return too! The accommodation was perfect and the briefings spot on. In fact I was able to turn up and switch off from any distractions and relax and concentrate on each part of the week in a prepared and enjoyable way. This is so important as there are so many factors that as an amateur in the mountains I would never have considered. The long experience of M.B.G. has ensured that every detail has been reviewed and refined to ensure the best possible experience and outcome for everyone. The hard part is the training, but if you do your part, the rest is taken care of. The guides were awesome, with outstanding experience in high mountains and dealing with everything that you might encounter. 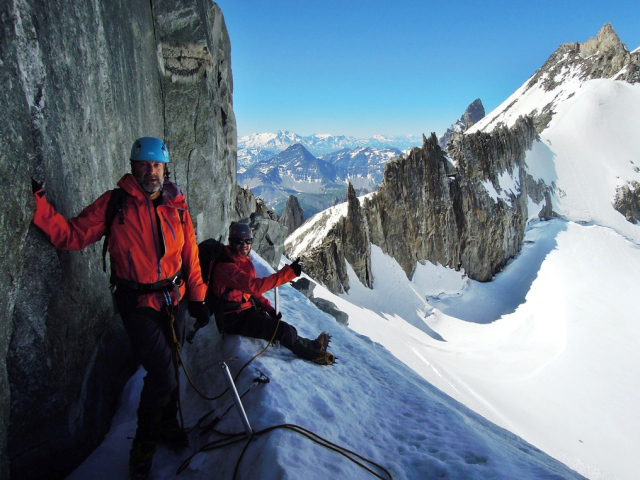 I had absolute trust in them that they had our safety in mind at every, yes I do mean every, step of the way, such that I did not realise until we arrived back in Chamonix that I had not once been nervous or anxious for my safety during both climbs and descents. Such is their competence that they enable and allow you to perform to your best by ensuring you are in control of your physical ability at all times. I felt a few reassuring tugs on the rope from my guide behind me on the way down when I stumbled or wobbled, confirming that they were alert the whole way. The guides were our friends in all senses on the mountain, engaging with us and treating us as companions rather than clients which made it a great team experience, especially as we no doubt tested their patience on many occasions. Their modesty and humour added to the group dynamic in a positive way that inspired us all to reach the top as a team and create such an exhilarating and memorable experience. The behind the scenes support team were superb in ensuring we were well catered for in all respects (food especially), and they were a pleasure to get to know. I had the most fantastic week with a great team and that included everyone involved, and ‘The Old Geezers and The Children’ as we became known as clients had the most memorable trip and fun you can imagine on a mountain! I cannot recommend M.B.G. enough to anyone who wants to experience high mountains and to test their personal strengths and limits in safety, without exposing themselves to risks beyond their control; just go for it it will be well worth all the effort. Dear MBG, I don’t think there are enough words to describe just how amazing of an experience I had during my 6-day program. From the very moment I arrived at the castle all the way to the final debrief I felt as if I was a part of the MBG family. And that is something that will stick with me for a very longtime. The attention to detail and meticulous planning was incredible throughout the entire course, it was clearly obvious that these guys knew exactly what they were doing! My trip had four of us total and we started with a meet-n-greet dinner our first night and the next morning we met our guide (Francis), John and Dee. They talked us through expectations, timelines and even the “what-if” questions. To have the owner of a company actually take time to meet all of the clients speaks volumes to how much he cares! Afterwards, Francis, our guide, even took the time to show us around Chamonix and showed us how to navigate the outdoor shops, let me tell you this was one of those added bonuses that went a long way. He taught us things such as gear selection, proper fitments, and even how to ask the right questions to sales associates. Next we were off to our first part of the trip, Gran Paradiso National Park. Unfortunately the weather was not the best but it didn’t stop us from having an amazing time in the mountains and on the glacier; Francis made sure the weather didn’t hinder us from having an amazing time. During our “Paradiso summit day” we had a small weather window to go out onto the glacier and we did just that. It was an incredible experience. Francis taught us how to work as a team on the glacier and we made it up over 3,600 meters onto the main glacier. The three days really proved that there is always more than just a summit, it really was the journey of working together and learning about ourselves and what we were capable of. Once we returned to the castle, a tough decision was made for one of our members not being able to attempt Mont Blanc. However, I will say that the MBG team and guides handled this in the utmost professional way that I have seen. I was very impressed with their debriefing and explanations in every aspect of what we did. Finally, the big moment, the three days for Mont Blanc! The experience of being on the slopes of Mont Blanc was spectacular. Our team of three was divided into two groups each with a guide to allow our ration to be 2:1 and 1:1. We began our summit day at 04:30, and let me say it was the most empowering and grueling thing I have ever done in my life! 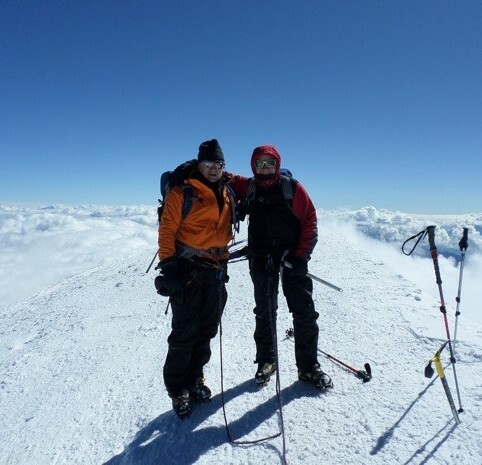 Two of the members of my team made it to the summit and I unfortunately only made it up to Dome Du Gouter and had to turn back due to altitude illness. But the guides made sure I was completely taken care of and safe before we climbed back down to the Tete Rousse Hut. Trust me, the climb to Mont Blanc is no easy walk in the park. It will take every ounce of your mental and physical strength to reach the top. Although I didn’t reach the summit, I am still extremely proud for what I accomplished and I will be returning next season with the MBG team to re-attempt Mont Blanc. Thank you for everything Team MBG, you guys are true ambassadors of the Alps! After climbing Mt. Rainier, I wanted to take another step in mountaineering and set out to do a bit of research. All three people I consulted suggested climbing Mont Blanc next and all three of them (from completely different parts of the world) suggested Mont Blanc Guides. I’m so thankful they did! In a word, the experience with MBG was EXCEPTIONAL. A to Z is taken care of to ensure the most comfortable and confident experience. I can’t stress the importance of this enough; it enables you to focus on the climbing and accomplishing whatever goals you set out with, with the comfort of knowing all logistics and other details are being sorted on your behalf. From accommodation to instruction, safety, technique, food, equipment, general advice, etc. etc., truly everything is well handled by M.B.G. There is a great partnership between the office team, the hospitality group (the food was incredible) and of course, the guides. 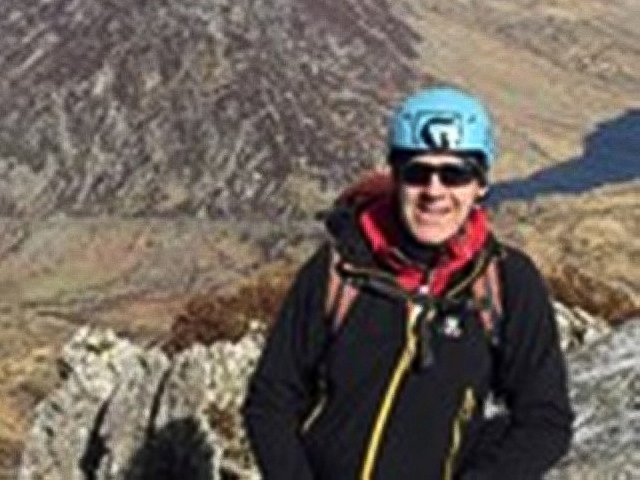 Our lead guides for the week were Francis, Simon, Andy and Dave, all expert in their craft with impressive experience and well equipped to lead both experienced and beginner climbers. Loads of support, tons of advice and just generally good people who were great to spend time with. We formed a great camaraderie throughout the week – you need to enjoy the people you’re going to spend that much time with, and we certainly did! What a fantastic experience with Mont Blanc Guides. From the moment we arrived the logistics, the people and the whole experience was faultless. We were led by fantastic hugely experienced and friendly IFMGA qualified guides Neil, Todd and Matteo, such that we felt hugely confident and quite honestly it never crossed my mind to be concerned for our safety. You were left feeling that they had all the bases covered and they were committed to teaching, leading and supporting us in achieving success. The set up is a smooth well-organised machine clearly experienced in putting together a successful program to achieve the best from every climber. From “base camp” at Chamonix where we were well looked after by Michelle (baker extraordinaire) and Elliott to the hire kit all being of good quality, and the design and delivery of the course, everything was perfect. Everyone involved was very friendly, supportive and encouraging which made the trip extremely enjoyable as well as successful. We were fortunate with the weather which was perfect throughout our six days which enabled all five of us to summit both Gran Paradiso and Mont Blanc in clear blue skies and sunshine. 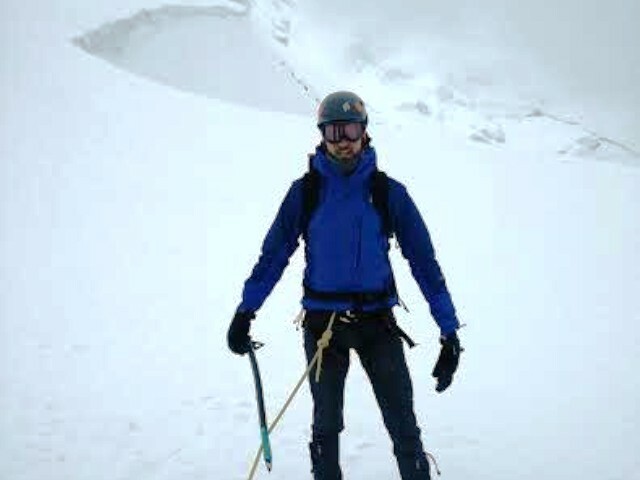 I would totally recommend Mont Blanc Guides who seem to have the right blend of working to get the best out of the clients and giving the best possible chance of summiting Mont Blanc whilst keeping them as safe as possible. I now wish they were not such pure Mont Blanc specialists as the Matterhorn looks tempting! 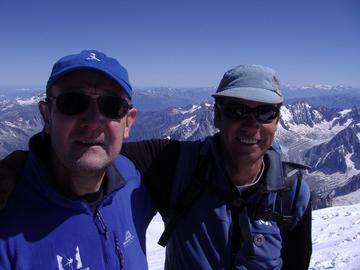 We’ve just returned from France and a most memorable 6 days with Mont Blanc Guides. We made for a somewhat unusual team: a 61-year-old “desk jockey” and his 20-year-old daughter; nonetheless we fit right in and had a spectacular time. I’ve wanted to climb Mont Blanc for years and am so glad I finally made time to do so. A few take-ways: climbing Mont Blanc is not easy; it’s much more difficult than trekking to Everest Base Camp or climbing Kilimanjaro. Being fit is critical to your safety and enjoyment. Be in the best shape of your life and then some. 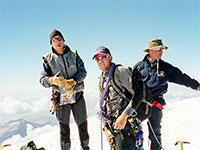 And secondly, climb with professionals such as Mont Blanc Guides. 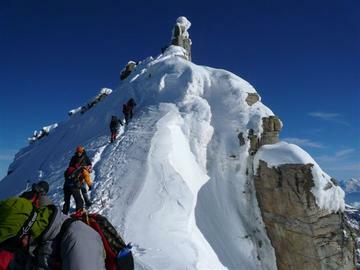 Their six-day program is very well thought out and organized and provides a very good opportunity to summit Mont Blanc safely. I’d recommend getting to Chamonix several days early and hiking and sleeping at altitude to acclimatize in advance. 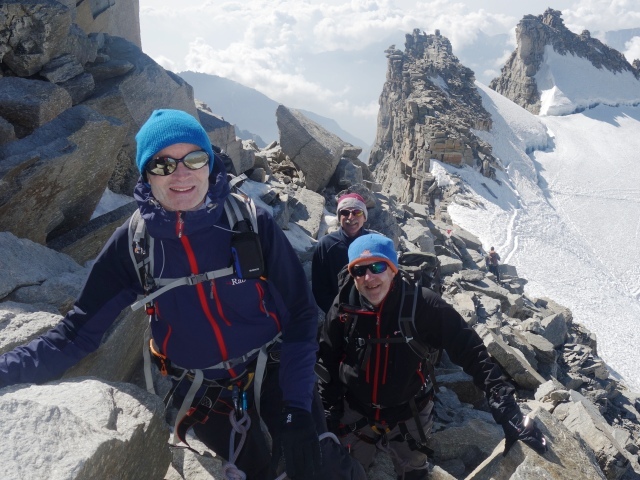 We enjoyed the company of special people, enjoyed great food and accommodation in Chamonix, and most importantly, had complete confidence that Mont Blanc Guides knew what they were doing and had our safety as their number one priority. Very personable and interesting guides who were exceptionally well qualified and knew how to make the experience full and rewarding. Highly Recommended. August/September 2018: After deciding that this year would be the year I attempt Mont Blanc, I searched the internet to set about finding a company to take me. It didn’t take long to see that MBG stood out. The website was easy to navigate and gave me all the information I needed to go ahead and press that ‘book’ button! I was so excited! I corresponded with Dee and Eva, both were fabulous! I had a few questions and worries about my lack of technical experience but they put my mind at ease instantly, while making it clear that my fitness was really important. On arriving in Chamonix on Monday (I used mountain drop offs recommend by MBG, they were very organised and efficient) I was met by Iva who showed me to my room that I would be sharing with a fellow mountaineer. It was really great that the room was ours for the entire week, no moving stuff in and out when you’re really tired – that’s important! There was a lovely communal lounge area with tea and coffee making facilities, and a beautiful view! I had that afternoon to wander around Chamonix, and met with the rest of our team for dinner. The food in the chalet was amazing and thoughtfully planned to give us nutritious meals, and the chalet hosts were a lovely couple who chatted away to us and really made us feel at home. A lovely way to spend our first night, getting to know each other. On Tuesday morning we had a huge breakfast, cereals, omelettes, toast and even homemade protein balls. This is when the guides arrived along with John (MBG owner and Head Guide). I was really impressed with the talk that John gave, he ran us through how the week would work, what weather reports looked like, and introduced us to the guides: Francesco, Pierre and John. 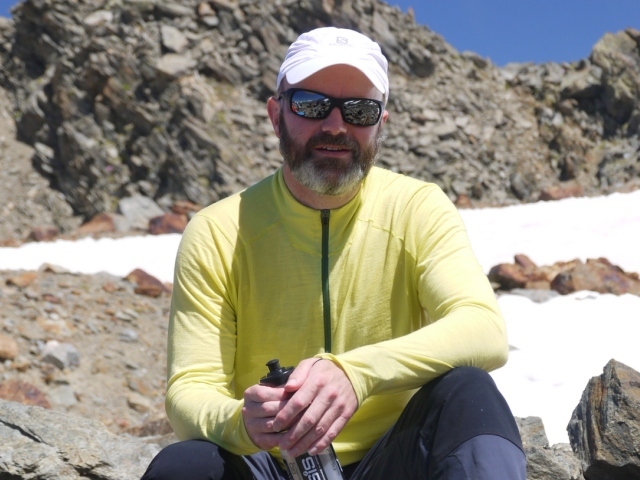 We each talked a little about what altitude we had been to and if we had experience with crampons, and there was a mix of experience levels as well as fitness. Then it was the kit check, all the kit that we intended on taking to Gran Paradiso had to be laid out on our beds to be checked by the guides. Some of the kit I had wasn’t suitable (I had ski gloves that were a bit worn and an ice axe I had borrowed that was too technical and heavy). There was time to do change gear in Chamonix before we left, but what was really great was the kit available from MBG on site at the chalet, it was so easy. I had my boots fitted, and considerable time was taken sorting out the right pair for me. You could hire boots, crampons, helmets and axes if required. Once we had all our gear fitted we wandered into Chamonix to purchase any additional gear we needed. We were taken to two shops; one that had a relatively budget range, still good quality gear, and another that was more top of the range gear, with appropriate price tags. It gave us all the choice to pick what we wanted to suit our own budgets. The guides came shopping with us to advise us on the gear we needed, which was a welcome help to me being faced with 10+ types of gloves to choose from. We then headed over to Italy to begin our accent of Gran Paradiso. This was a lovely walk through the pine trees along a beautiful hand made path, the pace was steady, making a stop at a water spring half way, then up to the Chabod hut, where before we rested and settled down we did a half an hour training with our crampons on, the guides showed us some skills and techniques to prepare us for the next morning. The hut was wonderful, with the best staff, and they were very welcome and fun to be around. The hut has running drinking water, showers and a well stocked bar, and we sat down for a very good three course dinner. Kitted up and ready after a 4am breakfast on Wednesday morning, we headed off. After an hour and a half we arrived on the glacier, the temperature had dropped a little and the fresh crisp air started to feel apparent. We got our crampons, helmet and harnesses on and roped up to our guides, and then continued across the glacier as the sun was rising. The crevasses seemed to grow larger the further up the glacier we traveled, some of them were really beautiful, others bottomless voids to be cautious of. A few more hours and we had reached the summit! I found it tough approaching 3700 metres with the air growing ever thinner, but the beauty from the summit diluted that quite quickly; the summit was a small rocky ledge (I had to keep my wits about me a little here!) but I felt 100% safe being roped to Pierre, our French guide. He has 37 years experience in these mountains, and you could certainly tell. After another night at the hut to help us acclimatise further, we set off down the following morning, stopping on the way back for some well deserved ice cream and coffee. Back at the chalet we were greeted with cakes, biscuits and other homemade treats, and after a tiring few days we had no trouble tucking in. That afternoon there was also a bit of time to rest or go into town to get any last bits to take to Mont Blanc. In the evening we sat down to dinner in the chalet, nervous and excited about what the next few days would bring; two members of our group had decided on returning from Gran Paradiso that Mont Blanc wasn’t for them, the guides had talked it over a lot with them and together they had arranged that they would spend the next few days doing some alternative peaks and concentrate more on some rock climbing. I opted for an early night in anticipation of a busy few days ahead. After breakfast the next day we made our way by minibus to the Les Houches cable car, then from there took the train that would take us to the highest point; it was a misty day with light drizzle and poor visibility. When we arrived at the Tete Rousse hut, we were showed where to store our kit and our beds for the next two days. Our room had 16 beds, it was comfortable in the dorms, a little chilly as to be expected. There are toilets, but no running water. So any water you required for either drinking, brushing teeth, washing etc had to be purchased from the bar. The communal area was cosy with ever changing faces! A real buzz in there! We had lunch, a fully loaded omelette that was very tasty! We sat with the guides who were continually receiving weather reports, and it was clear that safety was of the highest importance to them. You could see them willing the weather to get better so as to allow us to leave at 2am the next day, but unfortunately this wasn’t to be the case. The final report came in at 8pm and they broke it to us that we were not going tomorrow. We were a little deflated but completely understood, and we had the next day to spend in the hut until our next window on Sunday morning at 2am. We kept ourselves entertained chatting and sharing stories during Saturday the guides gave us a mini course on rope skills and different equipment and techniques, their knowledge was not only vast but their passion for climbing was well and truly apparent. Finally we were given the go ahead for an attempt at 2am the following morning, although we were told that we were on quite a tight time frame to allow us to summit and be down for the last train. We were given our guide groups and I was teamed with Graham and our guide Pierre. We sat with Pierre while he gave us a brief and advice on what to wear, how to pack our bags for accessibility of gear, food and drink and answered any other questions we had. 1am came around and we were up for breakfast to fuel up. As we stepped out the hut the crisp air hit me, the sky was beautifully clear, you could see down to the towns and cities below. It took us 1.45 minutes to get to the Gouter hut, Pierre our guide said we were making good time, then the next section was up to the Vallot hut. We arrived at the Vallot hut (really it’s just a tin box) we didn’t go in but added on a final layer, lip salve, quick snack and some warm tea. I had my energy bars in my pockets, they had frozen a bit so my salami snacks were perfect! At this point we knew we hadn’t far to go, just as well as both Graham and I were beginning to tire a little. The day was soon approaching as you could see the sun starting to glow. At one point I had slowed a little, the altitude was making my heart race and I was putting in a lot of effort. Just at that point I think Pierre could see me struggling a tiny bit, he stopped and pointed to the summit ‘we are nearly there’. He was right! We made our way over the domes until the final push to the top: it was incredible. I could feel tears running down my face and when we arrived in the summit, for some of the time at least, we were the only ones. The views were spectacular and the feeling of accomplishment was humbling. We had a few pictures and celebratory hugs before we made our descent back down to the Tete Rousse, we knew that as it was a last day ascent we would have the additional bit to climb down, which seemed to last forever with tired legs, but still full of adrenaline and pride we made our way to the train, onto the cable car and back down to Chamonix. Very tired but super pleased we arrived back to the chalet again to an array of cakes and other snacks, and once again, we didn’t hesitate to get stuck in. Overall if I had to sum up MBG I would say: organisation down to perfection, committed to safety, conscious of individual needs and abilities, excellent experienced guides, high standard of hospitality in the chalet, and above all clear pride and passion from all the MBG team. I would highly recommend them to anyone wanting to attempt Mont Blanc. Dear MBG team, within a month after booking the Mont Blanc course with Mont Blanc Guides I summited Gran Paradiso and Mont Blanc. This was only possible thanks to the professional process put in place by MBG. From the moment of booking the Mont Blanc course until the coffee and cake in the MBG chalet upon returning after the Mont Blanc summit the MBG representatives responsible for management, administration, hospitality and, most importantly, guidance on the mountain were professional, attentive and efficient. Friendly staff, comfortable facilities, good food and professional mountain guides contributed to a memorable experience. 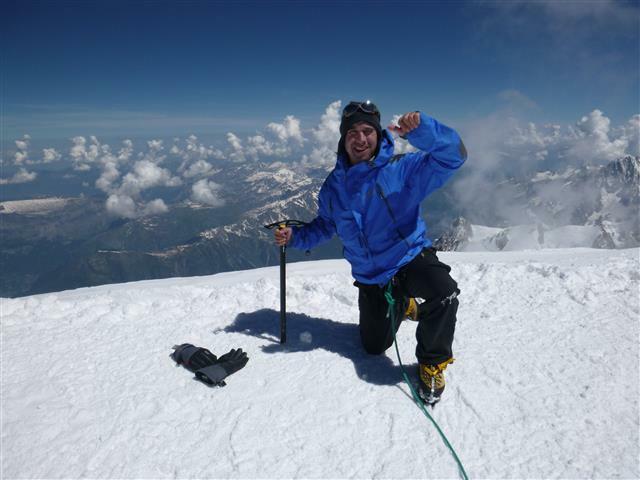 I can confidently recommend Mont Blanc Guides to anyone who wishes to summit Mont Blanc in the safest and most pleasurable way. My friend and I are originally from the Lake District so we’ve done our fair share of climbing and hiking; this, however, was the first time that either of us had done any alpine mountaineering. The support we had from MBG in the build-up though was fantastic; from the first phone call our nerves started to give way to excitement and we had a good idea on what we needed to do in regards to training in order to give ourselves the best opportunity we could to reach the summit. When we first arrived at ‘the castle’ we were warmly greeted by Dee from the MBG team and let loose on a table full of cakes that were fantastically prepared by the chalet hosts. The quality of the food was great and the accommodation itself is top notch. The room is yours for the entire duration of the course which is ideal. That evening you sit down for a meal with the other hopeful members of your group and receive a briefing from the guides who explain the plan for the week and answer any questions. The next day we drove through to Italy to the start of Gran Paradiso with a trek up to a height of 2750m to the Federico Chabod mountain hut. As far as mountain huts go, the food was great and there is running water for toilets, sinks and showers. 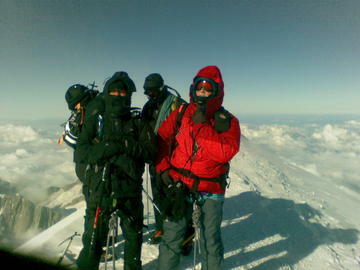 We set off at 4am the next day for the summit push of Gran Paradiso. Throughout the entire climb it was clear that we were well looked after and although it was physically tough, the hours just seemed to fly by, so make sure you take time to look around at where you are and enjoy it. Back in Chamonix and once again you’re greeted by cake and a fantastic evening meal. Having seen first-hand how we all managed on Gran Paradiso, the guides had to make some tough calls and inform a couple of members of the group that it was not safe for them to attempt the summit due to injuries and levels of fitness. This emphasised just how seriously MBG consider the safety of both their guides and their clients and it also provided some reassurance to the rest of us that the guides felt that we could make it. The hike to the Tete Rousse hut the next day was relatively easy going and the views from here are absolutely incredible. The hut isn’t quite to the same standard as the Federico Chabod hut in Italy; there is no running water and the food, although you eat everything put in front of you, isn’t quite to the same standard as the food you get back at the castle. 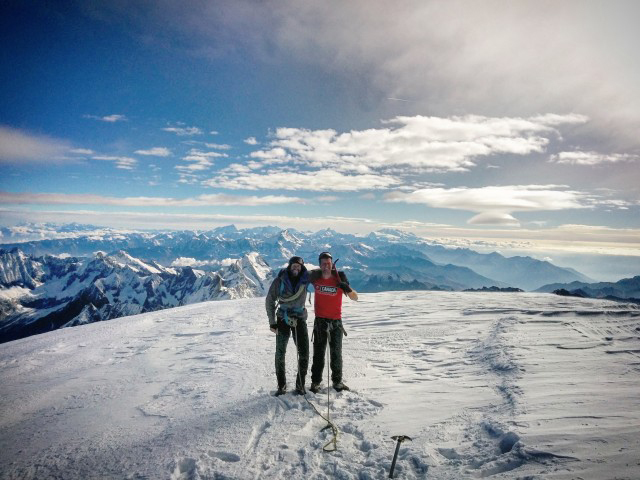 After a sleepless night, we set off at 2am for the Mont Blanc summit push. The first part of this was a gruelling 2 hour scramble across the Grand Couloir and up the steep rock face up to the Gouter hut. From here it’s relatively slow going but as you get higher and higher your legs and lungs will feel like you’ve been sprinting. As the sun rises over the alps in the distance the views are out of this world and as you get just below the summit, the knife edge ridges you walk/crawl up are truly staggering. Finally, the summit. Coming over the final hill onto the summit is the moment I remember clearest out of the whole experience and it’s one that I’m not likely to forget. All the hard work from earlier in the week and in the months leading up to it had paid off! 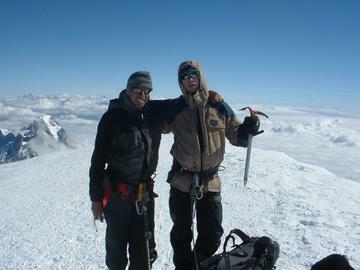 My son Alex and I set out in July for the biggest challenge in our small mountaineering career. We couldn’t really do altitude and crampons training in Hong Kong and when we arrived at the base camp in Chamonix we were far from sure that we were up to the task. And this is where MBG really came into play. From the first moment we felt that we were in the hands of true professionals. 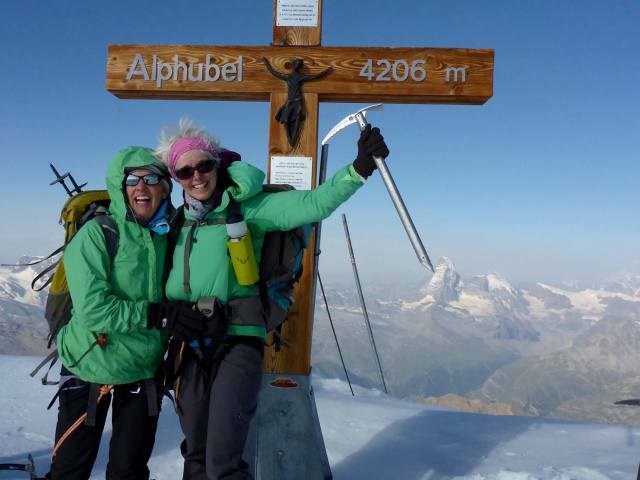 MBG made it very clear what we needed to achieve in order to attempt climbing Mont Blanc, and they promised that they would do whatever they could to get us to our goal. 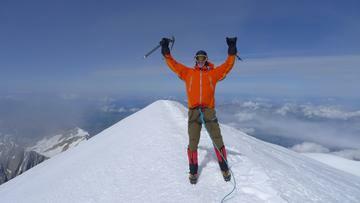 Incredible experience on Mont Blanc with Mont Blanc Guides! From day one the experience was awesome, the website explained EVERYTHING in detail and everything was even better than expected. The chalet is super clean, the location is awesome and very close to town, the views are great, the rooms super clean and the food is fantastic! 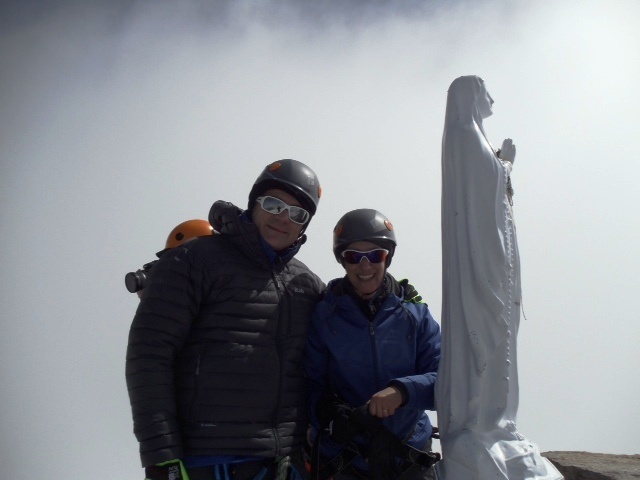 The guides were great, and the attention to detail was a key factor in everyone achieving Gran Paradiso (4061m) with fair weather conditions. All necessary equipment was available for rent, and although I had everything it was great to know it was there in case of any last minute need. Gran Paradiso was incredible, all was very well organized for all the group. For acclimatization also, it was a GREAT trip worth doing. The test however came when the conditions were NOT so great… After Gran Paradiso the Guides had really bad news, bad weather was most likely going to prevent us from trying Mont Blanc. Both High temperature (risk of rock fall) and very high winds (up to 120km/h!) were going to make it very unlikely to be able to try for the summit. At that point, we were given several great options including trying Monte Rosa (4600m) where the wind would be less, as well as other great climbing options in France to ensure we were going to have a great week anyway. 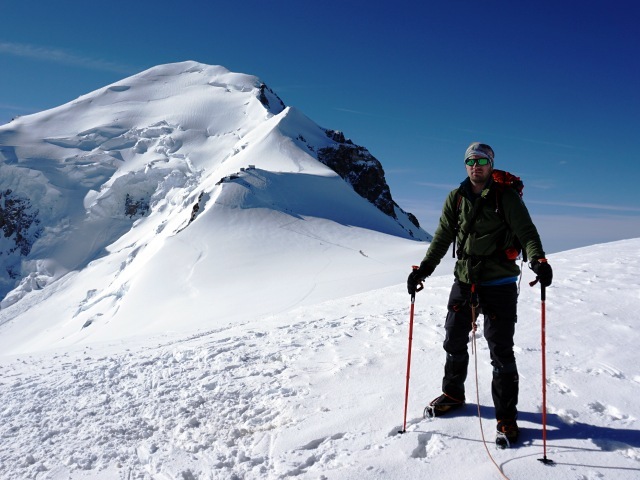 There was also the option to go for a look at Mont Blanc, on the understanding that the chances were very high that we would not be able to even attempt it due to the conditions, and would therefore not get another summit. 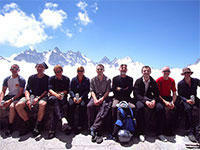 At that point, the eight people in the group split into four for Mont Blanc and four for Monte Rosa. As predicted, on Mont Blanc conditions were worse than on Monte Rosa, and though the Guides tried hard to make it happen (always with safety as their prime concern), the wait and conditions took their toll and three of my group decided to turn back, while I decided to wait just a little longer with my Guide Urbi. Finally he felt we might give it a try, and though many others were still turning round we continued cautiously and eventually made it! The whole thing was an amazing experience and incredibly fulfilling, though very physically challenging given the conditions we had to face on the day. I simply would have not made it without the great six day plan that included acclimatization in Italy, and the guides professionalism and experience to make it happen with a perfect balance between fun and risk. On our way back we faced the fury of the couloir which decided to “rain rocks”, so Urbi took us back up to the hut to wait for safer conditions and we went back down safely a few hours later. He was at all times calm in what was a scary situation, really a top notch Guide. If you are planning on trying this trip, make sure you are FIT ENOUGH and TRAIN for it. Is very demanding and is not just a weekend trip…. but really worth doing! Dear Mont Blanc Guides, just wanted to say a huge thank you for an incredible week in the Alps (1-7 July). The 6-day programme is clearly something that has been perfected and fine-tuned over many years, which is why it’s such a winner. I love how you’ve decided to focus on just doing one thing really well. 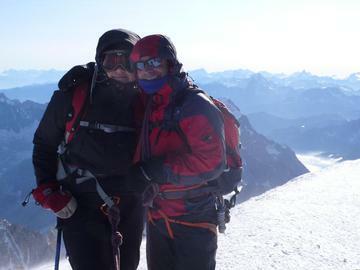 I am so proud to be in this photo with my friend Lynn on the summit of Alphubel (4206m) in Switzerland. When winds of 80-100 km/h were predicted for our Mt. Blanc summit day, the entire MBG team went into action to find another peak for us to climb outside of the stormy area. 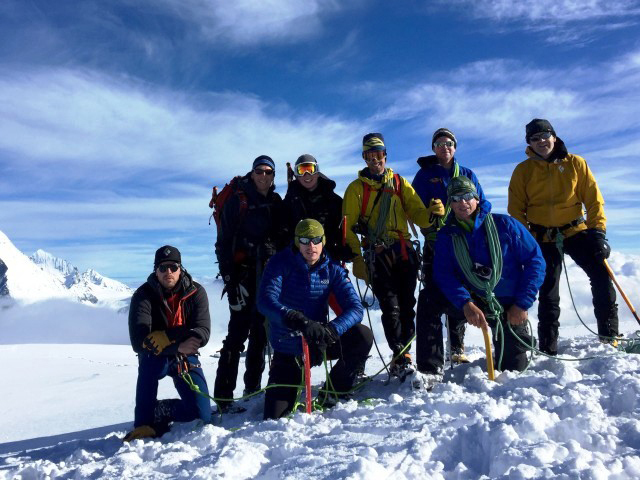 Our team of 6 had successfully climbed the Gran Paradiso for our training and were looking forward to Mt. Blanc, but the weather did not cooperate this time. Instead, we drove to Switzerland’s Alphubel, which was a challenging climb that allowed us to use our new skills on ice, rock and glacier. If you look closely at the photo, you can see the Matterhorn in the distance which presented itself so beautifully in the morning. Seeing it was a bonus to our climb that day. If mountaineering were easy, everyone would do it. But it’s not, and that’s why if your heart is set on tackling a massive challenge like Mont Blanc it’s key to have the best in your corner. That’s why I chose Mont Blanc Guides for my trip. 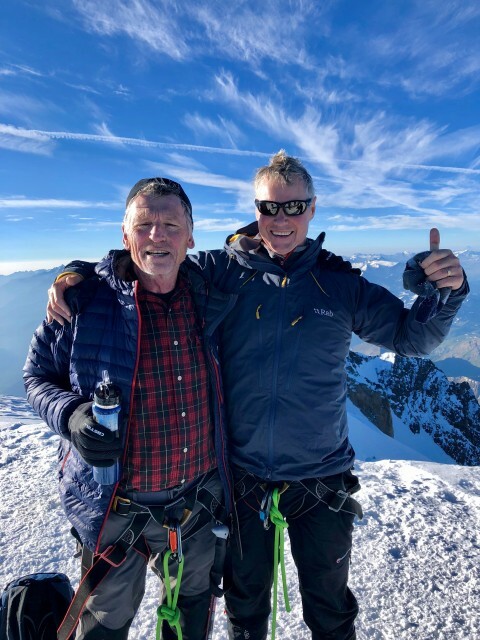 Summiting Gran Paradiso and Mont Blanc with my guide Peter Mason was an extraordinary and exhilarating once-in-a-lifetime adventure I’ll never forget, and for that I have to thank both him and the entire MBG team. Though I was the only climber in the group (due to some last minute cancellations and it being the end of the season), the entire experience felt premium, personal and incredibly educational from start to finish. Every question was answered, and every single need was met to help me reach my goal atop both towering peaks high in the alps. I’m writing this review on behalf of myself and the three friends with whom I shared this excellent experience. We chose Mont Blanc Guides’ course for our first ever alpine trip based on the reviews we read as well as their extremely informative website, and we are more than happy to say that from start to finish we made lifetime memories. Thanks to everybody at MBG for this. The booking process went smoothly and MBG’s lovely staff was available from the onset to answer any questions and assist before we even got to Chamonix. 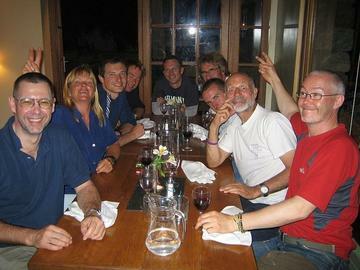 Once we arrived at our basecamp chalet we were made to feel very welcome from the off and the dining was excellent. After summiting Gran Paradiso in fine weather there was a lot of apprehension within the group in regards to whether we would be able to try Mont Blanc due to the weather reports and several unsuccessful previous attempts, but this was beyond our circle of control and we could only hope for a window of opportunity while waiting for a storm to pass in the Tete Rousse hut at 3,167m. The views from this point were breath-taking and above us we could view the next part of our journey, the infamous Grand Couloir we had yet to cross. The weather window came, and with a lot of nervous energy and excitement we set off at 1 a.m. with our headlamps. Watching the sunrise that morning was one the greatest views any of us had ever seen, but there was an even better one from the summit: to the delight of the four of us, we had all made it! 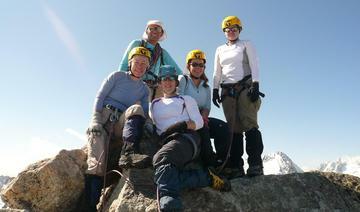 What a great trip I had with Mont Blanc Guides this summer. This was my second attempt but this time I had the added pleasure of my son who previously was too young. Would you believe it? I slept in the same room as I had in 2014. The itinerary with MBG is tried and trusted; whilst Mother Nature has the final call on whether you reach the top of Mont Blanc or not, the programme is designed to provide a challenge but always with safety in mind. Unfortunately conditions at the Grand Couloir were too dangerous to even attempt an ascent so following our acclimatisation on Grand Paradiso across the border in Italy our guides Christian, John and Ales along with the MBG team pulled out the stops to give us an equally challenging and enjoyable alternative. First stop was a ridge walk between the peaks of Aiguille de la Gliere and Aiguille de la Floria, a reasonably straightforward scramble with rewarding views down and across the Chamonix valley. The following day saw us travel through the Mont Blanc Tunnel back into Italy to begin our ascent of Monte Rosa. This entailed an overnight stay at Rifugio Gniffetti with an early start the following morning in order reach the Refugio Margherita (4554m) followed by a slight detour to Zumsteinspitze (4503m) before descending to the valley. We were not disappointed by the views, and clear skies ensured we were able to pick out The Matterhorn and Grand Paradiso amongst many others. A challenge but well worth the effort! September 2015: Day 1: After a military-style equipment check, we casually made our way to Refuge Frédéric Chabod in the Aosta Valley, Italy. Day 2: The first summit day, Chabod to Gran Paradiso. We set off in the dark, and were back enjoying drinks at the refuge by the early afternoon. Day 3: A late start for the decent back to the minibus and drive back to Chamonix. On the drive we were informed that Mont Blanc was off due to the extreme heatwave. Day 4: Plan B kicked off with a day trip to the Aiguille d’Entreves Traverse. This is an exposed granite ridge. It gets your heart pumping and you need a good head for heights. 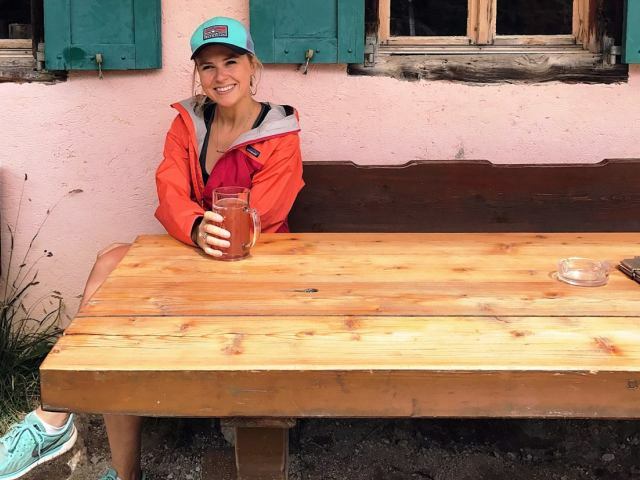 Day 5: Plan B continued with a drive back to the Aosta Valley, but this time to a different refuge – the Cabane Giovanni Gniffetti. Day 6: Summit day two. Gniffetti to Punta Zumstein. 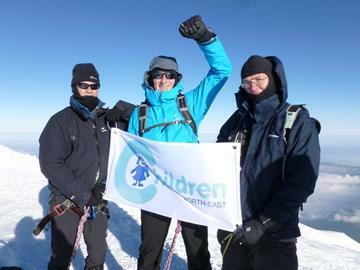 This time having reached the summit we then had to descend directly to the minibus (approx. 1800m). The use of a land rover and cable car came in handy here. June 2016: Day 1: We returned to the Aosta Valley, but this time we hiked to a different refuge (Victor-Emmanuel II) to where we stayed in 2015. Day 2: Summit day. Victor-Emmanuel II to Gran Paradiso. Temperatures on the mountain were significantly colder this time, with wind chill pushing -25 degrees. Day 3: An easy descent to the minibus for the drive back to Chamonix. Our chances of summiting Mont Blanc were discussed over coffee. It did not look promising. Day 4: Confirmation Mont Blanc was off (again! ), but this time due to heavy snowfall. Once again we had to resort to Plan B, so we made our way to refuge Guide del Cervino in Zermatt, Switzerland. Day 5: Summit day two. Cervino to the Breithorn. The views of the Matterhorn were spectacular, and in getting to the summit ridge we had to traverse a serac. Day 6: This turned out to be free time so we were given the choice of rock climbing or a via ferrata. In the evening we went out as a group for a celebratory meal in Chamonix. As you can see we were unsuccessful in summiting Mont Blanc in both 2015 and 2016; we did not realise, or maybe took for granted, just how many things have to be in your favour in order to tag this summit, there are simply no guarantees out there. That being said, Mont Blanc Guides have the flexibility and knowledge to adapt their programme to suit any circumstances, and we can honestly say that both programmes provided experiences that will last a lifetime, and for that we are truly grateful. Chamonix is such a special place, but none of this would have been possible without the staff, guides, chalet hosts and our fellow climbers. For us, this all started out with two brothers wanting to broaden their horizons, and a basic search on Google. Luckily for us it did not take long before we came across Mont Blanc Guides and the first trip was booked. It was then just a matter of working on our fitness and watching the diet in the weeks beforehand. Deciding to return with Mont Blanc Guides in 2016 was easy. We hope that you have found our testimonial useful. Overall, would we recommend Mont Blanc Guides to you? Yes, without question. Mark & Graeme, Liverpool. m_anderson@me.com P.s. See you in 2017 Mont Blanc Guides. Third time lucky? Our experience with Mt Blanc Guides was a bit unique as we decided to tackle the Alps as a father-son duo. Ever since we initially came up with the idea of narrowing in on Mt Blanc, we were hopeful we would find a team that would not only give us the best chance of summiting Mt Blanc but one that would give us the opportunity to learn the exact type of skills that would better prepare us for future summits in the Alps or elsewhere. After the 6 days with the company and our guides, Alberto, Tim, and Miles, we can say that the we absolutely made right choice. 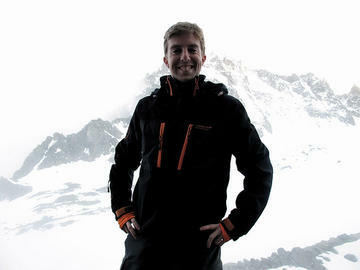 Having climbed Kilimanjaro earlier in the year, I booked with Mont Blanc Guides to climb Mont Blanc with my son Matthew. The Castle chalet was really nice, Dee, Dina and the chalet team were wonderful and the food could not have been better. There were 6 of us in the group and two guides – Jon Wigg and Domen Kastilec, so a nice manageable number. Kit inspection on the first morning was very useful as we both had a couple of items that needed upgrading to “Alpine Standard”. Unfortunately however on the ascent of Gran Paradiso both Matthew & I succumbed to altitude and fitness issues meaning we had to turn back; obviously this meant we wouldn’t be attempting to summit Mont Blanc later in the week. 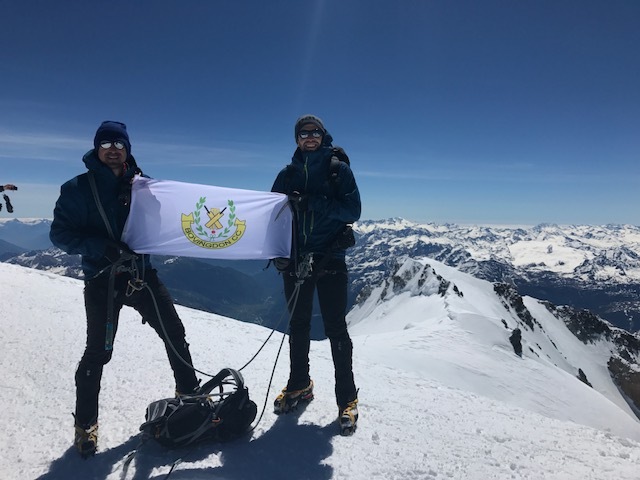 Dear John & MBG Team, we are writing to express our sincere thanks to all at Mont Blanc Guides (MBG) for helping us achieve our long held ambition to summit Mont Blanc. After deliberating which company to book with we settled on MBG based on their proven experience, solid success rate, honest website and as independent experts their focus on Mont Blanc attempts; we were not disappointed. The total experience exceeded our expectations from the moment we booked to the last farewell. Whilst the MBG website is extremely helpful with lots of practical information, when one of us wanted to speak to someone about a choice of clothing (jacket) to buy before arriving we were given every assistance and your friendly office staff were always forthcoming with practical help on all aspects of the trip. Special mentions must go to Dee, Agi and Tony based at the chalet. The whole organisation is geared up to ensuring a safe enjoyable experience for your clients; the selection of guides is obviously taken with considerable care as we had superb coaching on the Gran Paradiso practice run along with many small practical tips and insights which all came into play two days later on Mont Blanc. A further special mention for Fabio here whom we had most contact with and knows something about everything! Whilst in Chamonix the accommodation at “The Castle” was comfortable and spotless, and the breakfasts, cakes and evening meals were superb, all of which helped us to relax before and after our trips to the mountains. Can I just say a huge thanks to all at MBG and especially the guides we had on our course a few weeks ago , Miles, Matteo and Francesco. I had the most fantastically enjoyable week! We didn’t get to go up Mt Blanc because of the warm conditions and rock fall in the couloir, but the climb of Gran Paradiso and then three days around Monte Rosa were superb. I’d highly recommend Monte Rosa as a less busy and more beautiful alternative to Mt Blanc to anyone thinking of going on your course. In fact , if I can persuade a few friends, I’m thinking of trying to get a small group out to the Monte Rosa area next year and will come to you first of all for help in organising that. 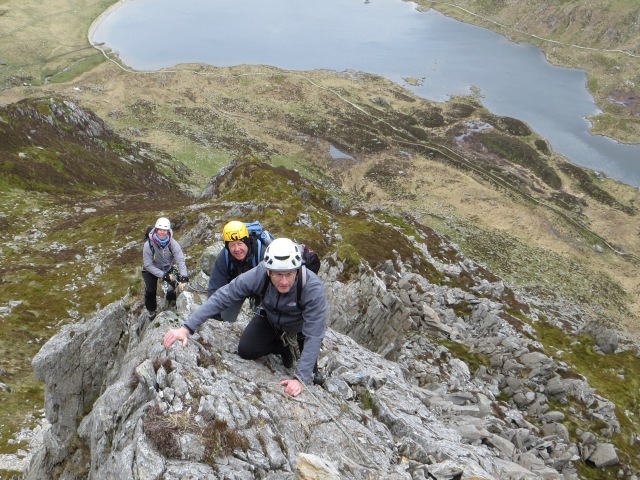 Having already committed to the 6 day Alpine course this year I attended the North Wales training course based on the recommendation on the MBG website; naturally I was a little uncertain about what to expect and what the course would provide. The course exceeded my expectations in so many ways – with a simple well thought out agenda that was delivered in a relaxed yet professional style by Graham McMahon. Each day started with a cup of tea and brief induction that covered possible routes and stages of ascent on Mont Blanc, travel, accommodation (and mountain huts! ), kit selection and personal safety, this then being followed by a day in the fells. Over the two days we enjoyed the best and worst of the Welsh weather, but despite this the guides stuck to the task and remained positive and engaging, spending time getting to know each attendee and encouraging conversation while providing “one to one” coaching. We picked up many new skills and techniques whilst on the fells, and suitably kitted out with harnesses and helmets we were taught how to operate with ropes working together as a team to move quickly and safely up and down the crags (this is designed to mirror conditions on the Grand Couloir of Mont Blanc). In addition we were given practical tips on the correct selection and use of equipment, nutrition and hydration and how to be energy efficient when operating in the mountains, focusing on maintaining a steady pace and balance. Well, what an amazing, exhilarating experience and made all the more special and enjoyable by what can only be described as an incredible set up and team at MBG. 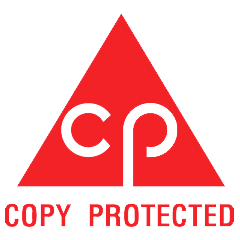 From the very first phone call 7 months out, our team of jangling nerves and apprehensive minds was put at ease with John’s expert advice and honest approach. The warm greeting at the fabulous ‘Castle’ base was like home from home and freshly made carrot cake on arrival went down a treat too from Agi! 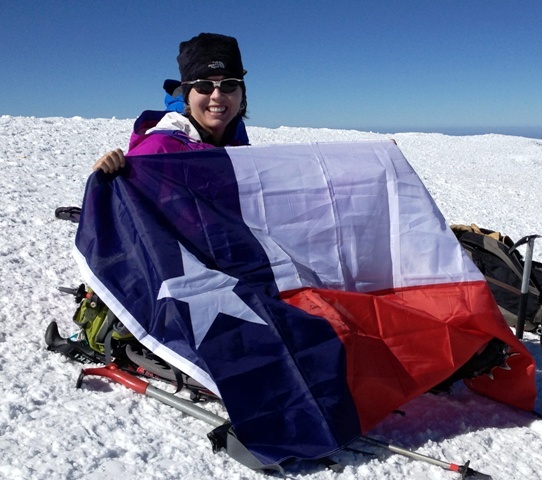 Once settled in, the transition from tentative novices to mountaineers was almost seamless. Dee is like the Mum of the chalet! The MBG gang covered every area of the week with great detail and we kicked off with Gran Paradiso which was simply magnificent. The climb took it out of us physically and the final ridge was certainly not for the faint hearted but we were well looked after and it prepared us well for the main task ahead. A relaxing boys night in watching a movie at the Castle whilst we steadied our nerves for Mont Blanc split the week up nicely and after some clear advice and reassurance from John, we were all in a positive frame of mind as we climbed into bed after another feast from the chefs. The luxury of Cham soon seemed many miles away from the basic mountain huts. 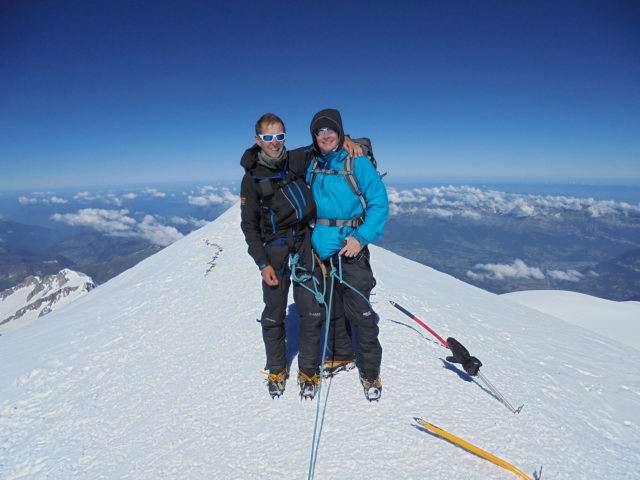 The Mont Blanc aspect of the trip was gruelling but so rewarding – it is a once in a lifetime experience. Our minds were racing the night before summit day but the head guide Tim brought everyone’s heart rate down with black and white advice and facts. Safety is the prime aspect of the MBG’s philosophy and it was clear that no one would be pushed beyond their safety limits. The banter from the #Fitzroy6 (our dormitory in the Tete Rousse hut) was flying and this team ethic was epitomized by the constant support from the guides and John and Dee back at HQ. We were ready to give it our best shot! After an exhausting climb up the rock wall from Tete Rousse to Gouter we cracked on into the beautiful morning sun. The journey was surreal. To describe it as enjoyable would be lying, but on reflection the memories are only of joy and fulfilment. The painstaking knife edge ridges that lead to the summit are something else. The views are remarkable, beyond words. We had done it. I’d just like to say how impressed I am with Mont Blanc Guides. As a frequent visitor to the region I had always dreamed of climbing Mont Blanc, however I think I under estimated just how challenging it would turn out to be. 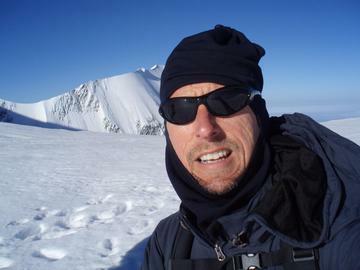 I learnt a great deal on my first attempt in 2014 with MBG when I summited the Gran Paradiso and made it to the Vallot hut on Mont Blanc, and although this was an achievement for me being 49, living at sea level and being built more like a rugby player, I still had the desire to make the summit. John from MBG gave me plenty of advice which I took on board and in 2016 I made the decision to have one more attempt. 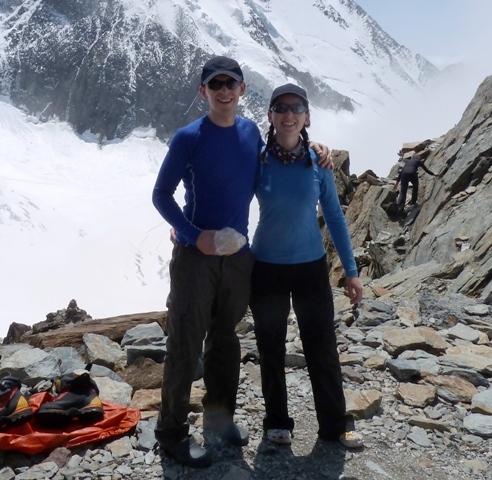 Myself and my boyfriend had a fantastic week in Chamonix with Mont Blanc Guides. The accommodation was great, only 5 minutes’ walk to the town centre and the food was outstanding, better than most restaurants in town! 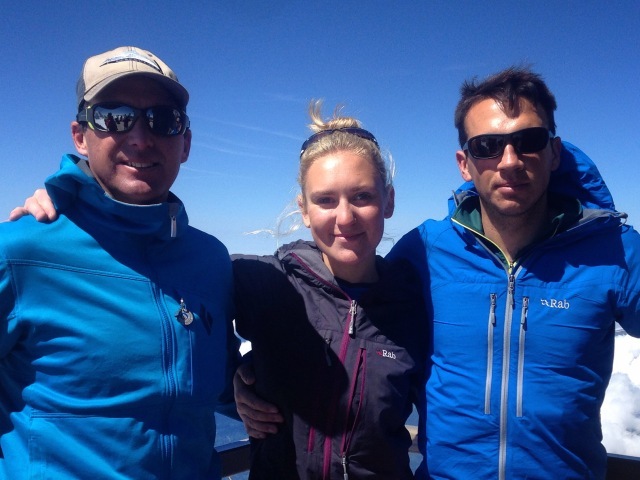 The first three days were spent in Italy going up Gran Paradiso with our American guide Eric. He was very supportive the whole way and kept at a pace that suited our level of fitness. Unfortunately due to the weather, the ascent of Mont Blanc itself was called off. 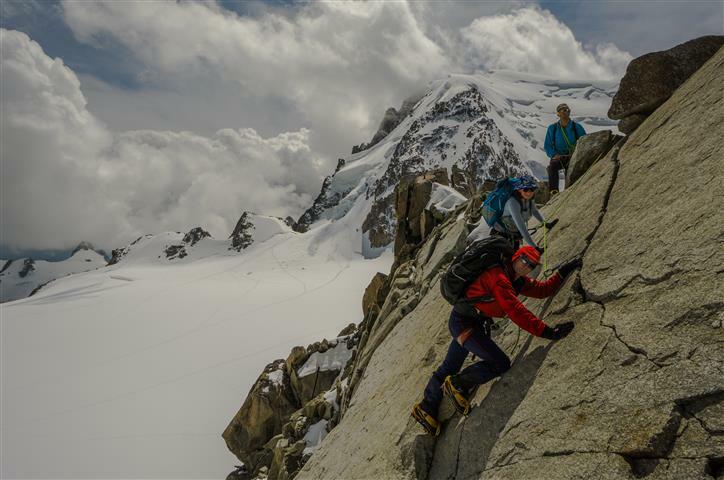 Mont Blanc Guides did everything they could to arrange alternative activities, including climbing Via Corda and the Arête des Cosmiques. Both were challenging yet incredibly rewarding with views to rival that from Mont Blanc! Although we did not get to tick Mont Blanc off the bucket list quite yet, our week in Chamonix was incredible. As a beginner to climbing and mountaineering, I learnt a huge amount in one week and achieved things that I could never have done on my own. My boyfriend, more experienced in both climbing and mountaineering, had the opportunity to improve on skills and left a far better mountaineer than before. Myself and two good friends Steve and Phil arrived on 13th July 2016. We had been talking about climbing Mt Blanc for years and decided it was now or never, but as things worked out it was to prove to be at a difficult time for anyone attempting this dream. The temperature for weeks before we arrived and during our stay was over 30°C, and so the Grand Couloir on Mont Blanc was in an extremely dangerous state. John told us straight away that we would not be climbing Mt Blanc by the Gouter Route and we were gutted to put it mildly. It’s in that context that I want to thank the whole team for one of the most fantastic weeks of my life. 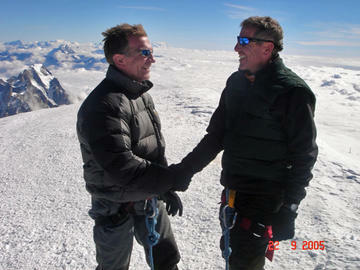 We climbed Gran Paradiso successfully – I have quite a fear of heights and mentioned this to Mark Puleio our lead guide. I had been worrying about the top crossing up to the Madonna, but Marc got me across before I knew it, and the panoramic views were breath-taking and worth the trip on their own. Mark and Alberto then filled our days that would have been on Mt Blanc with rock climbs and scrambling that I hadn’t signed up for! 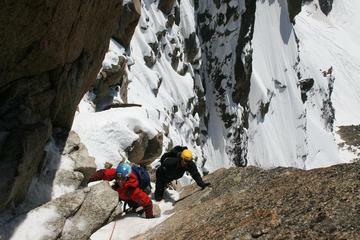 The climb across the Aiguilles Crochues Arête, was a particular highlight for all of us. Finally we were to attempt the first of the “3 Mont’s”, Mont Blanc du Tacul. 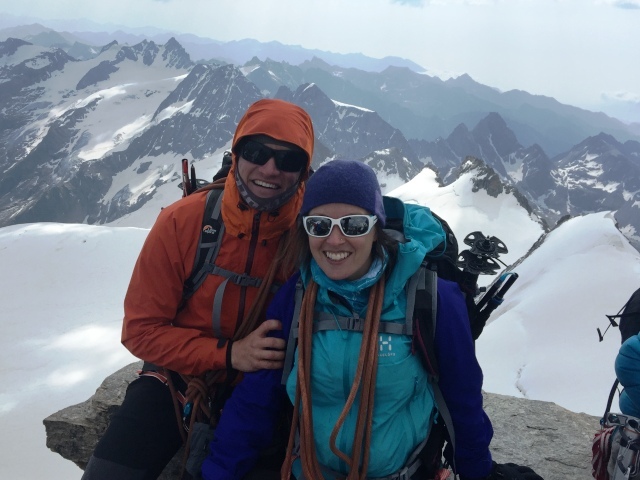 A thunderstorm curtailed the attempt, but I will never ever forget the decent and ascent of the ridge from the Aiguille du Midi to the col, it was terrifying and brilliant and I could not have done it without the expertise and professionalism of Mark. I booked with Mont Blanc Guides as I looked at quite a lot of web sites and this one looked well priced but not absurdly cheap. I then stumbled across a piece written in the Daily Telegraph written about Mont Blanc and the journalist had used Mont Blanc Guides so I thought things looked good. I built up to 60 miles per week fell running, did a climbing course and indulged my fetish with Mammut clothing (any excuse), nothing prepares you for ‘The Ledge of Doom’ on Gran Paradiso , or indeed the sharp ridge with an abyss either side of you on Mont Blanc so I suggest you need to overcome fear of heights before you go as well as getting yourself very fit as climbing for 12 hours is a challenge. I arrived in Chamonix at the Mont Blanc Guides chalet which is beautifully furnished, clean and chilled and was met by the delightful American lady Eva who immediately puts you at ease. The chefs we had were a couple and amazing chefs who were really friendly and made a massive effort with the meals we had, which were delicious. I am vegetarian (which doesn’t generally exist in France) and the food was delicious! The guides they use are incredible, helpful and nothing is too much for them. They are brilliant characters and they are massively experienced. You learn very quickly that if they suggest you do something then you need to do as they say straight away and respect their formidable knowledge of the mountains. The hut and staff on Gran Paradiso are great, lovely and friendly Italians. Mont Blanc is massive and does not suffer fools so your life is very much in the hands of your guide. The climb across the grand couloir and up from the Tete Rousse to the Gouter hut is very sobering in the dark at 4 a.m. I can tell you! We all 6 of us managed to get there in a massive wind which was quite interesting at times! After experiencing our week with Mont Blanc Guides in Chamonix, I can now attest to how incredible the MB preparation course in North Wales really is! If you live in the UK (or anywhere in Europe for that matter), I would highly suggest making the journey to spend the weekend learning with Graham and his team. You will cover so much, and leave the weekend feeling both better prepared and more confident in your chances for a successful week on Mont Blanc. Personally, I found both the classroom and practice sessions very useful. Indoors, Graham walked through the required kit in detail, bringing his own pack to demonstrate what will be needed. As a result, Max and I were the best equipped and most organised team on the mountain. He also discussed the two possible Mont Blanc routes and told us exactly what to expect through pictures and his own experiences. From this, we got a good base understanding of the possible ascent options, which was critically important for the ever changing weather and subsequent plans in our particular week! Graham also taught us how not to ‘faff’ (i.e. – digging around in your bag for things unnecessarily): while it doesn’t sound like a big deal, I can assure you that this skill alone is reason enough to sign up for the weekend! I chose MBG’s course for my first ever Alpine experience based on the reviews I’ve read as well as their extremely informative website, and I can gladly say that I had an absolutely fantastic time! The booking process went smoothly and MBG’s lovely staff was available from the onset to answer any questions and assist before I even got to Chamonix. Everything was organized to perfection and the long experience of the company in organizing such courses was evident from the start. I was very pleasantly surprised with the very comfortable chalet where I met up with the rest of the group and where Tony and Aggie indulged us with their fantastic food! I have just had the most amazing week climbing Mont Blanc and Gran Paradiso with Mont Blanc Guides and I feel that I owe it to John Taylor and his team to give credit where credit is due, because the whole experience was flawless. The detailed and frank nature of their website first attracted me to the company but what sealed the deal for me was the excellent customer service. Every enquiry was answered promptly and we had plenty of those because I had dreamed of this trip for years and wanted to get my preparation just right. This friendly advice continued throughout the trip – nothing was too much trouble. 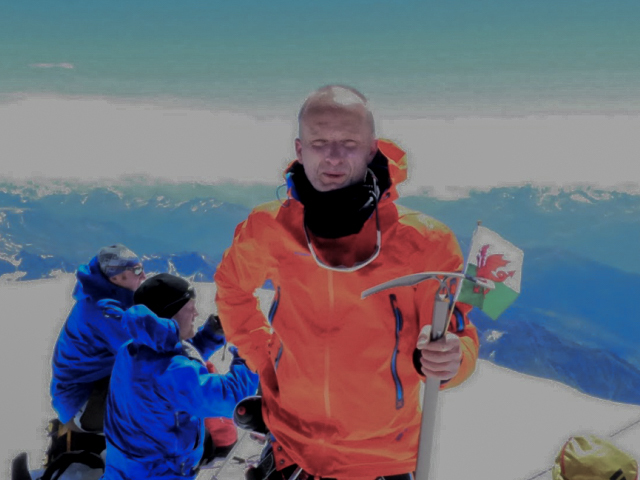 I wondered why they called it a “course” on the website and soon found out – right from the kit check I found out that I was not going to just tick off summits but I was going to learn so much about alpine climbing. John went above and beyond, clearly showing his love of the mountains as he explained every step of the process from assessments of weather conditions to the practicalities of rope-work for glacier travel. Our group really felt part of everything and not just like casual observers. We had a 50/50 chance because of the wind and cold conditions but I have to say the timings on summit day were spot on and we made it! I was also impressed with the wider course logistics – we didn’t have to organise anything from the minute we arrived at the beautiful Castle chalet to the moment we left – leaving our new home reluctantly at that! I have been climbing mountains for years and it is rare that I come away from any trip without suggestions for improvements, but this time I have. These guys don’t just know how to keep you safe, they know how to look after you, and I left Chamonix with the most amazing memories and a burning desire to return! Thanks John, Tim, Klemen, Dee, Isla and Sammie! All the best Simon. 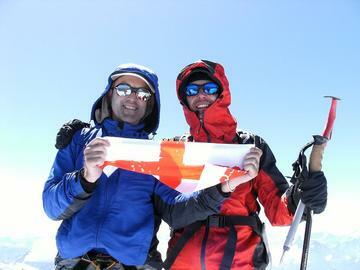 Dear Madam/Sir, We joined the Mont Blanc course starting Saturday the 21/06. We would like to share our appreciation and satisfaction with the week we spent with your organisation and guides, Graham McMahon and Marc Puleio. We had a wonderful week to say the least, your organisation was spot on and everyone was incredibly friendly and helpful. The girls you employ to look after us (evening meal and breakfast) were lovely, food excellent, very friendly and helpful. The accommodation in the chalet was perfectly adequate for the time we spent there, but we really did appreciate being able to have an en-suite room. We were extremely lucky with the weather and did manage to summit both peaks which obviously was the cherry on the cake, but had a fantastic time with our guides in any case. Both Graham and Marc were excellent, we felt very safe at all times and they both managed to combine perfectly light-hearted conversations with the times when we really had to pay attention and be serious. We learnt a lot from them and would be more than happy to recommend them to anyone. We will certainly recommend your Company to anyone that wishes to have this wonderful experience. Thank you once again for this experience which will stay with us forever. Kind Regards Nadia Mongelli and Franco Boeri. 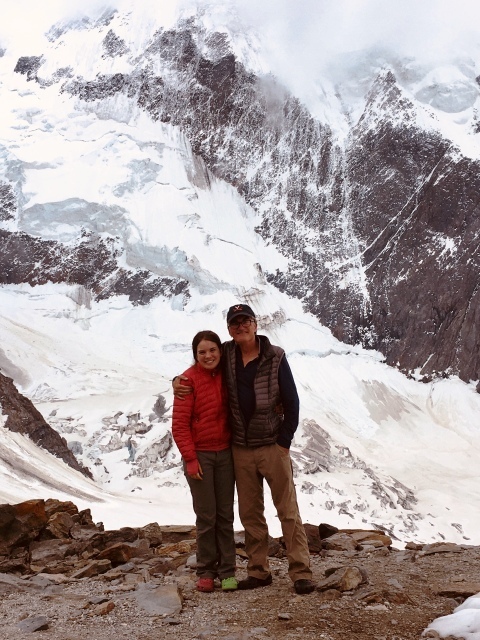 Hello Dee, please forward this to John Taylor…Just a thank you for a great trip – even though I was not prepared, I was fortunate to climb both mountains! 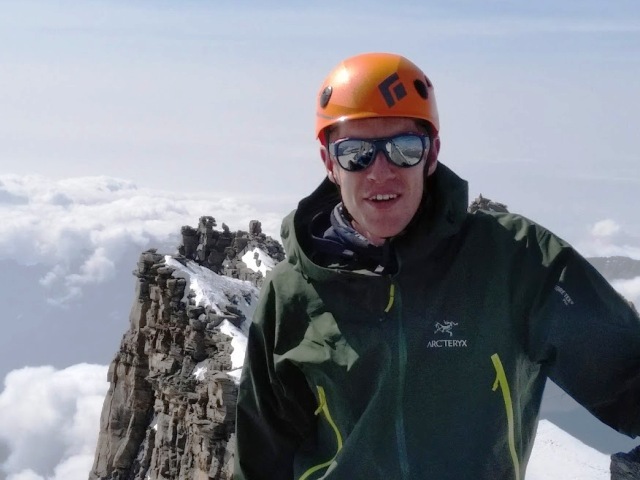 This thanks to a great team of guides led by Mark, but just a word regarding Ales Cesen my guide on Mont Blanc (he was on his first trip for you) and without him I don’t know if I would have summited, a better guide, professional climber and person as a whole one could not wish for. Dear John, Thanks very much for great holiday. If you would like to use below as testimonial with picture of myself and Anna taken on rock slab approaching Cosmiques Hut 25.7.14, you are very welcome. 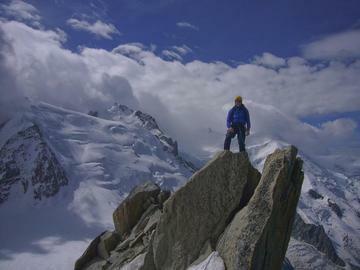 I would very much recommend Mont Blanc Guides to anyone considering climbing this mountain. 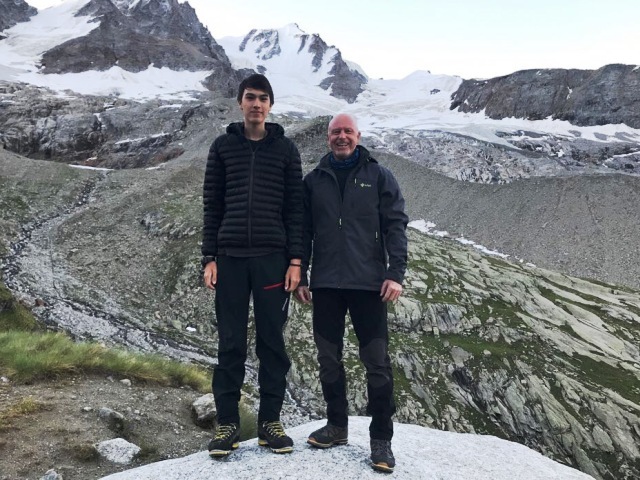 Myself and my daughter (16 years) climbed the Gran Paradiso and then Mont Blanc with Mont Blanc Guides this summer and were very impressed with the expertise and emphasis on safety of John and the other guides. We learned a tremendous amount about the Alps and mountaineering and had great discussions around the table in mountain huts! Chalet in Chamonix very comfortable, with helpful staff and good food. Weather in the Alps (as anywhere) can be changeable and we needed to be somewhat flexible in plans to accommodate this. Paul Marshall, Lancaster, UK. 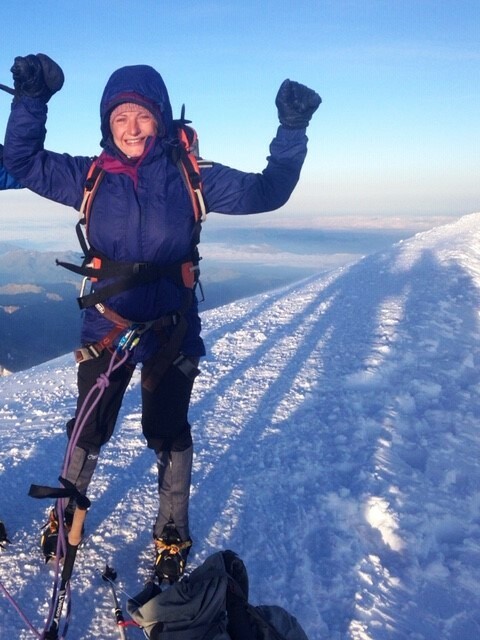 With absolutely no mountaineering experience to my name it was a tough call to expect to get to the summit of Mont Blanc in the space of one week. I was made extremely welcome from the start and upon meeting the guides Simon and Pete it quickly became clear that the task ahead was serious and not to be taken lightly but at the same time they instilled a considerable level of quiet confidence in the whole party. The “practice run” in Italy was an eye opener but throughout Simon and Pete were highly professional, encouraging and patient. When it came to the big day we were blessed with perfect conditions. It was unquestionably arduous but phenomenally rewarding. I and my new pal Neil from South Africa were guided by Pete who somehow managed to combine patience, humour and determination to get us to the top and he succeeded! It was just the most amazing moment for me. To stand on top of that mountain, which we had to ourselves, was sensational and completely unforgettable. The whole experience exceeded my expectation/anticipation in every way and it is not possible to pay too great a complement to our guides. Life changing? I thought you might like to see the review that I posted on TripAdvisor regarding our climb. I am very happy for you to use it as a testimonial and would be happy to speak to others considering booking with you. 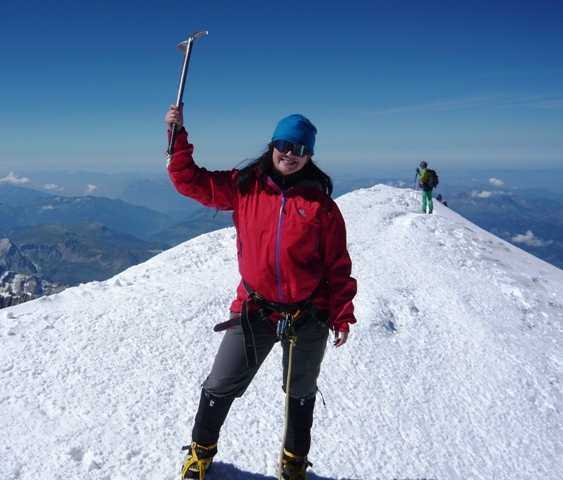 I climbed Mont Blanc via the Gouter Route with Mont Blanc Guides in August 2013. 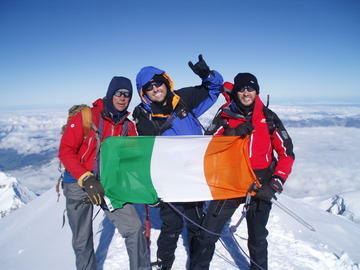 Probably the hardest thing I have ever done (I found it much tougher than Kilimanjaro) and were it not for the professionalism of Mont Blanc Guides I probably would not have summited. The whole trip is extremely well-organised, from the excellent chalet accommodation in Chamonix, the quality of the rental equipment, the preparation climb of Gran Paradiso (the tallest mountain entirely within Italy) through the attempt on Mont Blanc itself. At one point it appeared as though we may have marginal weather for the climb (although fortunately we ended up having a clear day to summit) and the effort that went into ensuring that we would be positioned so as to have maximum probability of being able to make a summit attempt should a weather window open was very impressive. There was a high level of involvement from John Taylor, the owner, who even though not guiding on our trip spent a considerable amount of time with us. 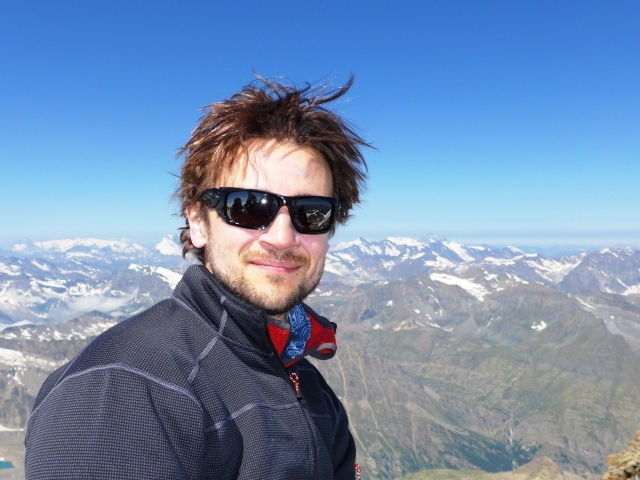 Special mention also to head guide Matthieu and our summit guide Andreas. 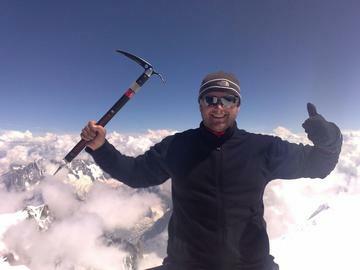 There is no doubt that Andreas’ efforts were the deciding factor in my successfully summiting. 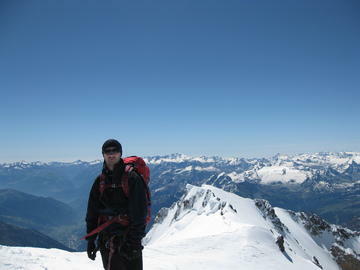 I would have no doubt in recommending Mont Blanc Guides to anyone considering the mountain. The fact that they specialise in Mont Blanc only makes a huge difference I believe. Regard Keith. 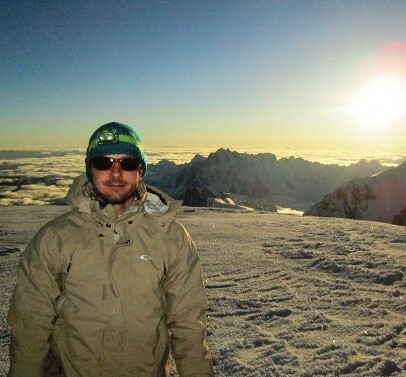 I would like to thank Mont Blanc Guides and their team for the great experience they gave us. Starting from the welcome, over to the very nice and comfortable rooms, to the great and freshly cooked food, a big thanks to Katie and Matt right here. Also the Guides and the tours were just brilliant, friendly, funny, supportive, and outgoing. All in all I would say there is not much you could have done better. I worked in hospitality for most of my life, working in Germany, Switzerland, USA, England, and Czech Republic in some very good hotels, so I know what I am talking about! It was the friendliness of every single one of the team who made the biggest impression on me. I also thought it was a very nice touch that the owner of the company was there for Jen, when she had trouble with her knee and also had a small chat with us after finishing the tour. Thanks again for the great experience and all the best to the Mont Blanc Guides team. Best regards Manny. Last year I chose MBG to attempt to climb Mont Blanc; unfortunately the mountain chooses you and the weather and avalanche risk prevented us from making any sort of ascent at all. This year, I chose MBG again for my second attempt as they were professional, have an excellent course program and lovely accommodation. They even handhold you a bit, especially if you’re a novice, with gear inspections and advice on equipment and food etc. 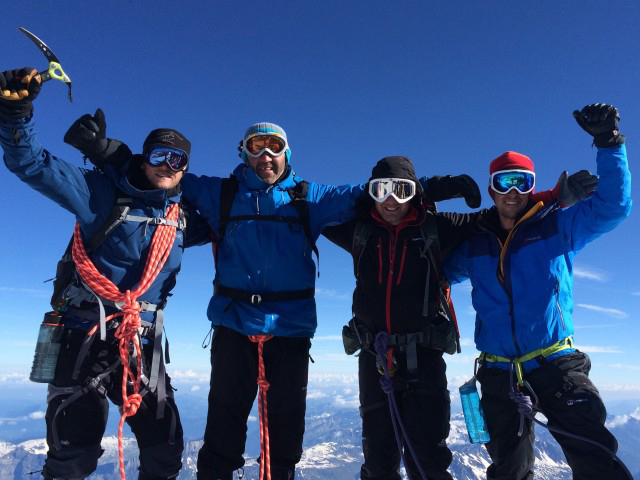 They deploy some of the best guides around, I give huge credits to our guides Peter Mason, Mark Chauvin, Joe Stock, Simon Abrahams and Eric Larson for guiding us to the summit of Gran Paradiso and Mont Blanc. 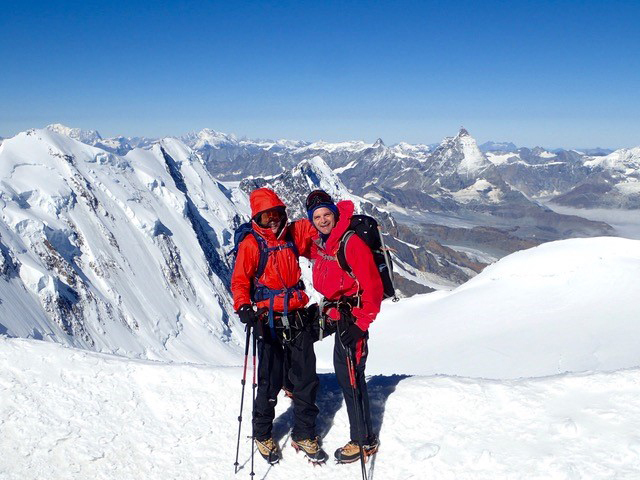 They are very experienced, highly competent mountain guides with genuine down to earth attitudes, and between them they’ve climbed mountains across the globe. Our team this year were very lucky to have them guide us and we all made it to the top. Summit day was perfect – clear blue sky, long sunny day and not a cloud in sight! Thank you Mont Blanc Guides! Cheers, Laura. 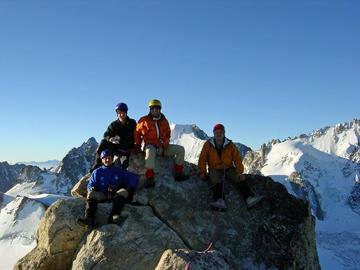 I can’t thank Mont Blanc Guides enough for their friendliness and expertise on my course. Right from my initial emails they showed their dedication to their customers with quick and extremely helpful replies. I honestly believe that the team of guides on my ascent made the whole experience feel not only safer than it actually was, but also more enjoyable. After detailed briefs on the both ascents of Gran Paradiso and Mont Blanc and continuous feedback during the climbs, there was always time for a laugh or joke. There were times on the easy parts of the tracks that I felt like it was a group of mates going for a casual walk we were laughing so hard. The guides Simon and Peter made both ascents, while Bruce and Graeme joined us on Mont Blanc. All have extensive experience and are extremely competent and friendly. The guide/client ratio was great, nice and small and clients were. I enjoyed the ascents so much, I wanted to do them again the next day and this was possible because of the advice on the web site. The accommodation was great, the food was great and the hot tub after the return was a great way to try and get my head back to reality. Hi to you all. Well it’s been virtually a month now since my first ever trip to the Alps and as John said the difficult bits of the climb begin to fade but the good bits still remain, so much so that I’m itching to do something else now! Sadly I doubt my wife will stand any more sleepless nights whilst I toddle of up mountains but I’ll work on her. Anyway now that the agony/euphoria has died down I felt it only right to say a big, big thank you to you all for what was possibly the most amazing set of experiences I’ve ever had. Ever since I was a small child I have dreamt of standing on some high snow-capped mountain but always believed that was only the province of ‘real’ mountaineers and not for the like of little old me! However thanks to you guys and not forgetting the girls Dee & Katie, you finally made a small boys (old mans) dream come true. To be honest as I’d never been to the Alps before other than flying over them to somewhere warm, having never been much above 4000ft never mind metres and knowing that any summit would be reliant on the vagaries of the weather, I came with a pragmatic view of just being there will be magical. As such after having such a perfect day to summit Gran Paradiso I could quite happily have gone home satisfied there and then. But to then get Mont Blanc as well really was unbelievable. I cannot thank Andrea enough for his perseverance with us as I was acutely aware of the length of time we were taking and given the threat of afternoon storms was convinced we would run out of time and he would turn us around without summiting. Thanks again! Hi Dee, This is a little belated but Nikki and I would like to pass on our thanks to all at Mont Blanc Guides for an incredible, memorable week. The course was very well organized and weather changes were exceptionally well managed. 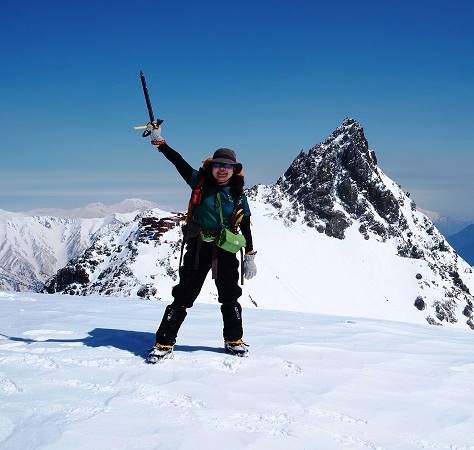 The knowledge, experience and personalities of the guides helped both of us achieve our goal of reaching the summit whilst learning lots at the same time. Special thanks to Bruce, Simon and Christian who made the whole week thoroughly enjoyable. Kind regards, Andy. Hello, I am Takako who joined the course between Aug 31 and Sept 6. Since I did not have much time to write on feedback form, I would like to say thank you by this email as I got back my home in Tokyo safely. I really appreciate everyone from MBG as I had a wonderful time and was able to achieved one of my dream. 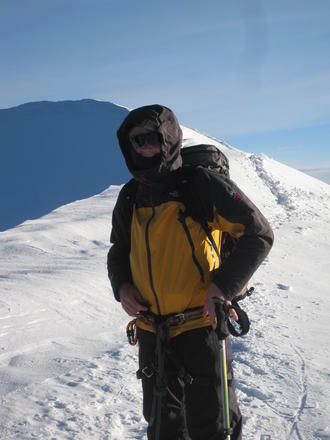 John, I think the program is really great for having a chance to climb two great mountains in a week as mostly likely (as far as I know) other programs have training on just glaciers and not going up to summit. Under these program, my acclimatization went well and I did not feel uneasy at all during I was in mountain. ?Dee and Tracey, thank you for all communication done between and after booking. With your prompt response I was able to make decision very quick and was prepared for my adventure. And cakes were delicious too!! Matt and Katie, thank you for welcoming like a family. I felt I was at home and was able to stay relaxed though I joined the course alone. And last but not least, Simon and Pete did a great job. They taught me not only technical skill but also kept encouraging and gave me confidence. This helped me a lot and eliminated my uneasiness which I always had since leaving my country that I could not keep the same pace with people who has longer legs than I do! Once again million thanks to all of you and hope to see you again next year! Cheers, Takako Yoshida. Matt and Katy at the chalet made me feel very welcome and at home, Katy giving me some of her personal supplies as I was trying to tape up a bad toe and Matt even driving me back to my arrival hotel to get my luggage. The guides are rock stars, they have the mountains in their DNA. Such an ease and beauty to everything they do, they are complete professionals, cautious, aware, and realistic. Simon handling all the logistics of transfers, tickets, and hut arrangements made the climb feel easier, and they were all tough and firm when necessary. I always felt completely informed of the plan, timings, and procedures, and they also took pride in my success for which I give them absolute credit. I can’t talk highly enough of John and his team at MBG. From the moment I found their (excellent) website, to the help, support and advice they gave me – answering questions before I booked, providing great support and advice before I arrived and also during the climbing week. Having tried twice previously to summit Mont Blanc I was keen to give myself the best possible chance this time around – and although nothing is ever guaranteed, if you want to increase your odds of being successful – don’t look any further than MBG, they really are the specialists when it comes to this “little hill”. John and his team of guides have a great cocktail of being knowledgeable, good at what they do and most importantly being keen to ensure their clients are informed, and get the absolute maximum from their week. They take the time to explain what they are doing, pass on knowledge, and make the week a thoroughly fun and enjoyable experience. I came away from the course having summitted both the highest mountain in Italy (Grand Paradiso) and the highest in Western Europe (Mont Blanc) – but also came away with incredible memories, invaluable insights into rope techniques, climbing efficiency and also a big smile from spending time in the company of some great guides, who also happen to be great people too. The accommodation was superb, the food excellent, the training climb was spot on, and the whole structure of the week really does put you in the best possible place to achieve your objectives. I passed many other groups on the mountain who I actually felt sorry for, not having booked with MBG. I wouldn’t hesitate to both use John and his team again and also actively recommend them. 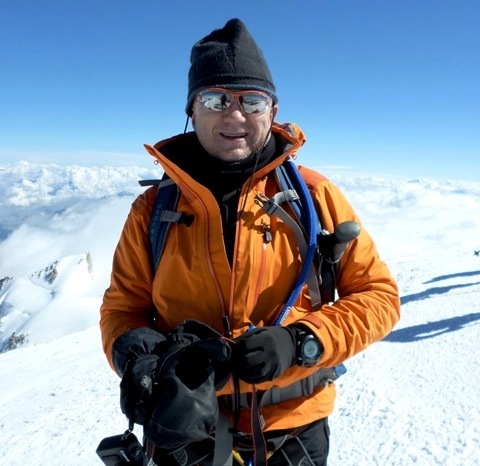 Hi John, I wanted to thank you once again for the fantastic organisation, professionalism and commitment to getting us to the summit of Mont Blanc. You and your entire guide team made the ascent of the Alps’ highest summit appear much easier and safer than it actually is. Despite the difficult weather conditions your willingness to be flexible, your team’s extensive experience, terrain knowledge, access to live weather reports and last but not least good relationship with the management of the mountain huts made it possible for me and the entire group to summit. From start to finish the six days on the mountain were efficiently and skillfully organised. The fact that we had a high guide to client ratio made it easy for the stronger of us to climb without worrying that someone who is not coping with the altitude or is coming down with a cold will prevent the entire team from summiting. I also wanted to mention that the the team of guides you work with is of the highest calibre and their local knowledge, fantastic attitude and focus on safety is exceptional. Last but not least the cost of the entire trip, although appearing to be slightly higher than some of your competitors, is actually inclusive of all expenses and fees and as I can myself confirm is excellent value for money. Standing on the top of Mont Blanc will forever be a cherished memory and an achievement I can always look back to and feel proud of. Regards, Plamen. Hi Dee, just wanted to say a huge thank you to John and everyone in the MBG team for two terrific weeks climbing this and last year. 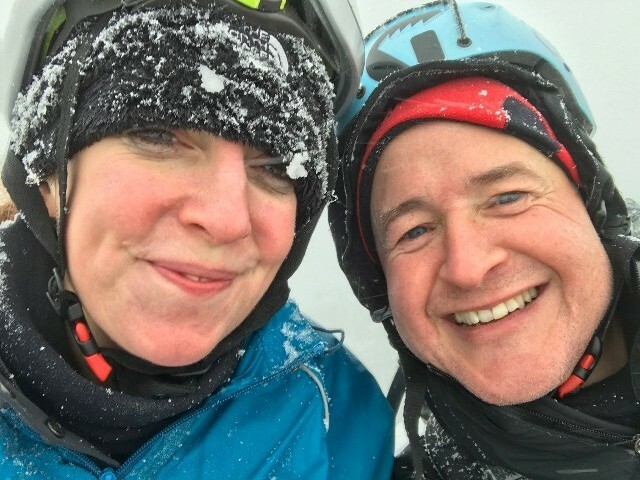 Joy and Mike were outstanding hosts in Chalet Prarion keeping us all superbly comfortable, well fed and as always going the extra mile to ensure we had everything we needed. Miles (last year) and ‘English Mark’ (this year) along with their respective teams of guides (Liz, Simon, Eric, Andrea and ‘American Mark’) were all so superbly professional and understanding of a range of capabilities and experience, and always with a weather (!) eye to our safety. Thank you also for your support from the MGB office. Each course taught me new skills, extending and challenged my boundaries and introducing me to a host of new friends. 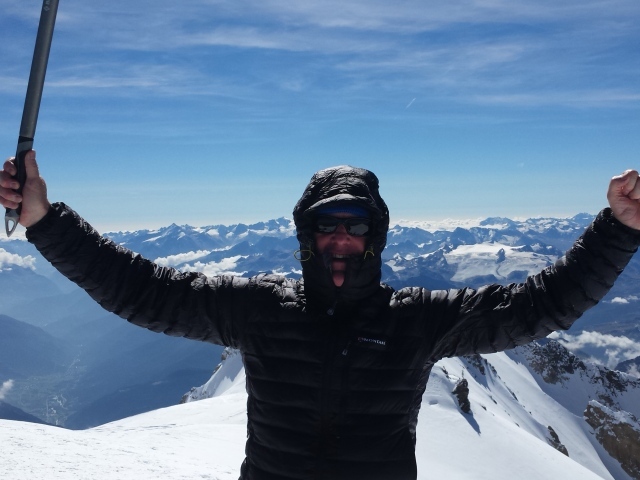 Eventually standing on the summit of Mont Blanc – just awesome!!! A huge and much deserved thank you to everyone and best wishes for the remainder of the 2012 season. Cheers,Colin. Jon, just a quick note to thank you for a fantastic week. You will probably realise that we have all put a lot of effort in over the last 9 months or so to give us the best chance of making the summit and it has been so worthwhile. The whole experience from the initial briefing, the training climb in Italy to the main event was organised and professional. Your delivery was always calm and composed which offered so much confidence to the client. Your decision making in the most difficult situations not only gave further reassurance but also highlighted the seriousness of the task ahead for those deemed capable of an attempt. I guess that your main attribute has to be fitness and mountaineering skills/ experience, which you clearly have in abundance; your leadership and communication skills are even more impressive! You should be very proud of yourself. Thank you for making a dream come true for me and more importantly making sure that I came home safely to look after my family. I wish you all the best and maybe see you again in the mountains. Many thanks, Steve. Hi John, I hope you enjoyed the étape as much as I enjoyed the course. I had a fantastic time and it has sparked an interest that I certainly will be pursuing. 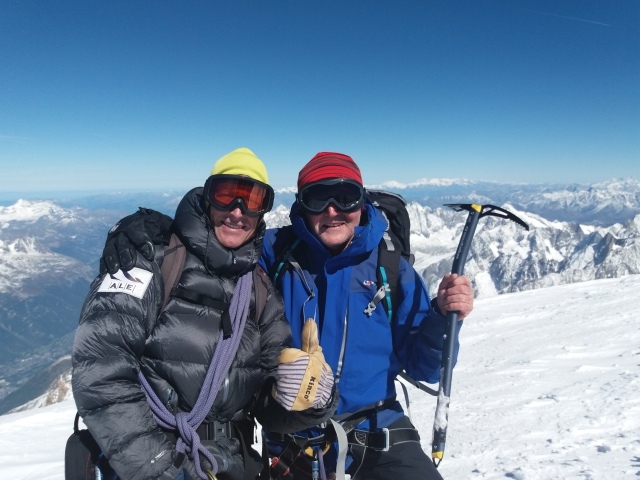 Even though the weather was not kind to us to make the summit of Mont Blanc, the Paradiso summit and the Cosmiques (my wife reminded me that it was 32 years ago that we first saw them) made for experiences I shall never forget and provided many stories for me to tell at my 50th last weekend. So, thank you very much to you and all of the team at Mont Blanc Guides (Mark, Mike, Frances & Dee) and Nomadic Ski. I had a fabulous time and really enjoyed staying and climbing with you all. I hope to catch up with you, may be next summer for a cycle or perhaps this winter for guided skiing. Many, many thanks. Kevin. Hi Dee & John, I wanted to to drop you a line to thank you all very much for making my trip the experience of a lifetime. From the first contact with the office to the point of saying goodbyes having successfully made the summit, I have to commend you all on your level of professionalism. The pre-course admin was fantastic regardless of the amount of questions I posed and the subsequent alterations I made to my booking. All the guides were friendly, approachable and above all, subject matter experts in the field of mountaineering, instilling confidence in their abilities from the outset. 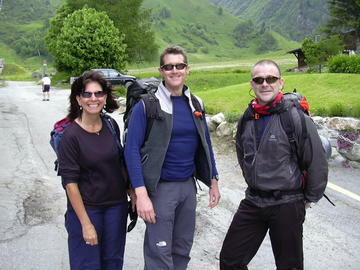 The accommodation was great and the chalet hosts, Mike and Joy added value to the whole package. A fantastic week all in all so thanks again! Best regards, Matt. Just wanted to say thanks to all the team at Mont Blanc Guides. I had an amazing week and that?s mainly thanks to the superb service of MBG. I have friends who are looking to climb next year and I will most certainly be recommending you guys. From the advice, the transport, the motivation, the safety, the accommodation to the general good atmosphere created, I could not have asked for more from that week. Thanks again and all the best for the future. David Doyle, Dublin, Ireland. Thank you for a great week. All aspects of the trip were very professional and the guides Liz, Mark, Frances, and John were fantastic and played a big part in making it a really special week. The chalet provided an ecellent standard of accommodation, and Yvonne was a great cook. 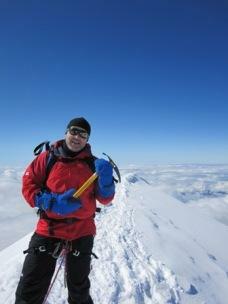 It was hugely satisfying to reach the summit as a lot of training and preparation went into it. The itinerary really make sense as it was great to stand on the summit without the crowds. Many thanks, Alex. John and the team, thanks for a fabulous and very fulfilling week in the mountains. I’ve never done anything like it before but I will certainly be doing more of it when the occasion permits. 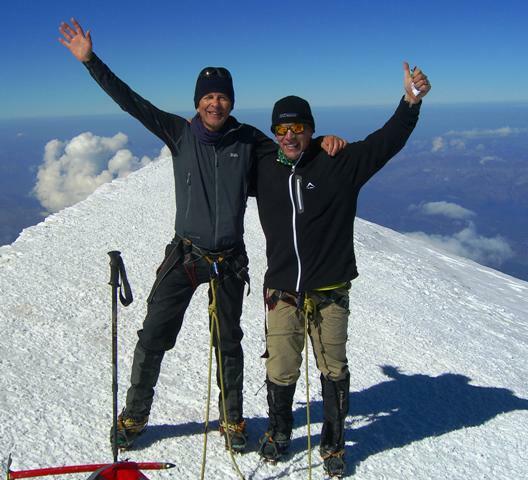 May I express my particular thanks to Miles for unparalleled safety leadership, and a special word of appreciation also to Simon, whose adjustment of the pace of ascent along with kind words of encouragement got me to the top of Gran Paradiso when I was about ready to quit. As this was effectively an introduction to alpine mountaineering for me, it doesn’t bother me at all that the weather prevented us getting up Mont Blanc; the week’s activities more than fit the bill for me.I look forward to meeting the team again as soon as I can schedule it around my work commitments. Many thanks and best regards, John. Thanks for a great trip, it was top class from start to finish, congrats to John for such a fine business, Bruce in particular made the course so professional and I found his relaxed manner and vast experience cast any doubts or concerns I might have had aside, he is an excellent ambassador for and excellent company. Also the chalet and the food was excellent, and with my hospitality roots I tend to be very critical on these matters, but the location and comforts were top class. Although we never made the top, I really felt that Bruce was as determined as any of us to take the best shot at it, and had no doubts that it was the right decision to turn around, and I was very satisfied in the knowledge that we took our best shot at it, and on a personal level, satisfied! so in my books that a personal summit to achieve in itself. Regards John Burke. Hi John (and team), I?ve joined your course early June 2010 and from the first day I was really satistified with the professionalism of the organisation as well as the facilities which were included (comfortable chalets, a private cook). Despite all the effort and organisation the weather didn?t seem to be that great as a strong wind was blowing in the village as well as up in the mountains. Also the forecast was pretty bad, so a back up plan was being made behind the scenes while we were having our challenging rock climbing course as an alternative on the first day. Since the weather was bad on the French side of the Mont Blanc it was proposed to start climbing and acclimatisation on the Italian side of the massive. That was a fantastic alternative! Then the weather changed a little bit giving us a very small time window to reach the top of the Mont Blanc. With just a few hundreds of meters climbing ahead of us we had to turn back because of a heavy storm turned out to be there in the top again. I would definitely recommend your organisation to anyone who is interested in climbing Mont Blanc, especially since you have a tailored approach for the group and every individual (if necessary) and because of the flexibility you could offer a group in case of bad weather. Thanks again! Mario Voorbij. Hi John, just wanted to say a huge thank you for an incredible week in the Swiss/French Alps. 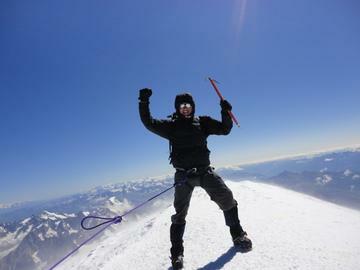 We may have been unsuccessful in our Mont Blanc summit attempt, but I seriously had one of the best weeks of my life. Aside from the spectacular scenery, I’d like to thank you in particular for the course you ran. You were incredibly informative, understanding and, most importantly, patient (I was basically starting from zero mountaineering experience). I’d also like you to pass on my thanks to Eric, our other guide, who was also fantastic. Must also give a mention to Jo and Ashley who catered for us at The Castle. Really exceptional food and good company too. 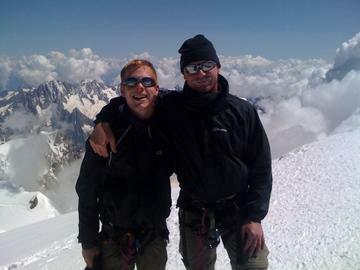 Rob and I will definitely be returning for another crack at Mont Blanc in the coming year or two. We’re confident that for future trips we’ll be able to acclimatise on our own, and hire a guide for a couple of days for the main ascent. I’ve learnt a whole new array of skills that will stay with me for a life time. Thanks again John. Best of luck for everything in the future, be it family, business or aeronautics! Take care, Ed. Hi John, I was on your course of 15-21 August; I’m back in Denmark now, but would like to thank you for a great course! 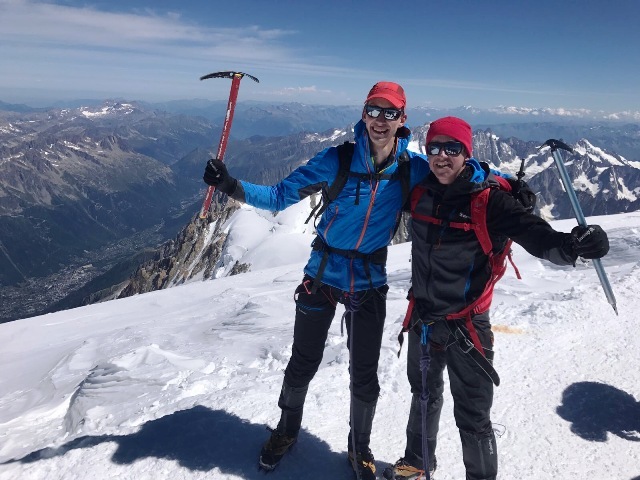 The way you, Simon, and Yves handled everything was highly professional, and the whole course was well planned, clearly showing that you are indeed the Mont Blanc specialists! On the day the course started I had a chat with Carolyn, and we both had mixed feelings. Neither of us was very keen on “group tours”, as we normally like to do things in our own way and at our own pace. I still feel that way, but at no point during your course did I feel like it was a group tour. The concept you have made, with smaller groups doing things out of sync with everyone else is highly recommendable. As you might remember, we all 10 made the top. Surely the good weather and a super group that just clicked made the whole experience extra good. But I think that most of us would have enjoyed the course even if we had had to make an alternate climb due to bad weather. Thank you for a great experience, which will last a lifetime! Cheers Michael Huus. Hi John, we just got back and felt that we should send you an e-mail; we just wanted to say thank you for an amazing experience. The course you run is the most professional but friendly and satisfying thing that I have ever had the pleasure to participate in. Everything just felt right from when we arrived at the chalet in Les Houches to meeting the guides to stepping onto the mountains. I would be very grateful if you would pass on my/our thanks again to Mark who was the ultimate professional but who also made you feel like you had known him for years and instilled trust and confidence fom the start. Also from me I would like to thank Liz from the bottom of my heart, as without her I would never have made it to the top. I suffered with my asthma but under her guidance and Mark’s faith I managed to succeed at something which I had dreamt of for 30 years. At the time words could not express my gratitude to the two of them. If you want to, feel free to pass on my e-mail to anyone who in the future may want to know how your courses are run. It would be a pleasure to share my experience. So thank you again and you never know our paths may cross again if I fancy another mountain. Yours faithfully Mark Eavers / Neill Curtis. Dear John/Mark/Miles/Miles and team, just to say thank you and all your team for the experience of a lifetime. 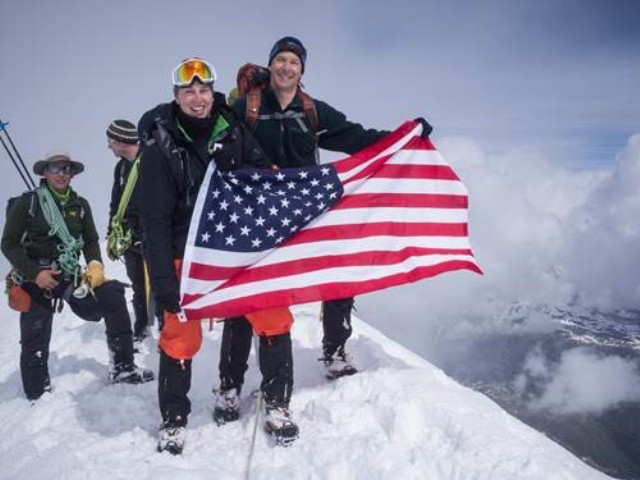 Reaching the summit meant a great deal to me for many reasons as you know and without the support from you and your team, we would not have made it. The programme put in place ensured that acclimatisation was reached with utmost professionalism and achieving this with a great sense of humour really helped. It was clear to see why the smaller peaks were climbed first, as this had a bearing on reaching the summit, and the feeling of being in safe hands made the climb even more enjoyable. We couldn’t have wished for a better group of guides, as it was their encouragement that ensured that my son and I reached the summit. The whole trip was fantastic, yes it was hard going at times but with the support of team around us we all knew we would pull through. 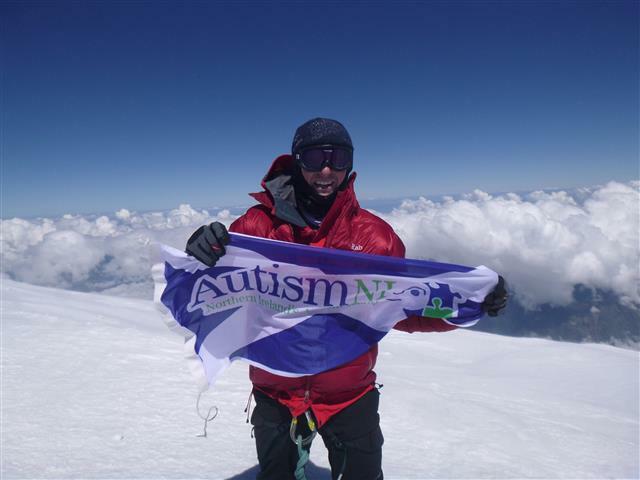 This climb was made easier by all the staff’s willingness to help and coach where required, from the chalet staff to the guides themselves, and my son and I owe these people a great debt, as without them the summit would still be a distant dream. I hope to go back to Chamonix in the near future, not just for a holiday but to keep in touch with the guides with whom we bonded with so well and to thank them all once again. Many many thanks for an overwhelming experience. Andrew Warman. What a fantastic week I had last year with you despite the weather precluding a summit bid. 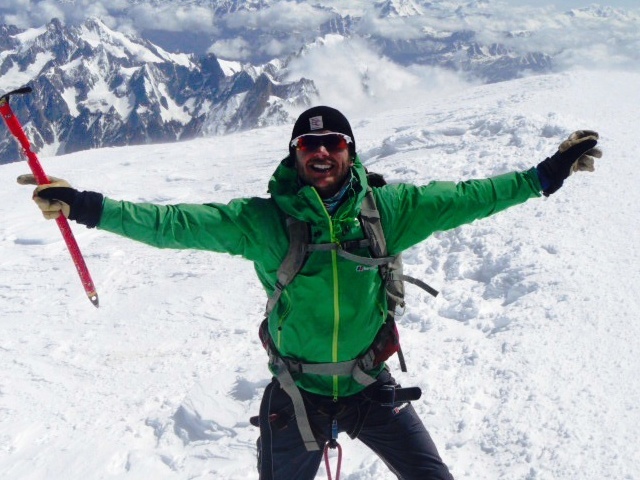 The decision by the guides not to attempt Mont Blanc was absolutely the right thing to do, their first priority was to the safety of their clients as well as the whole team, and given the stormy conditions it would have been foolish to continue. I had no hestitation, however, in returning again with you this year for another try, given your excellent safety record and professional, competent guides. 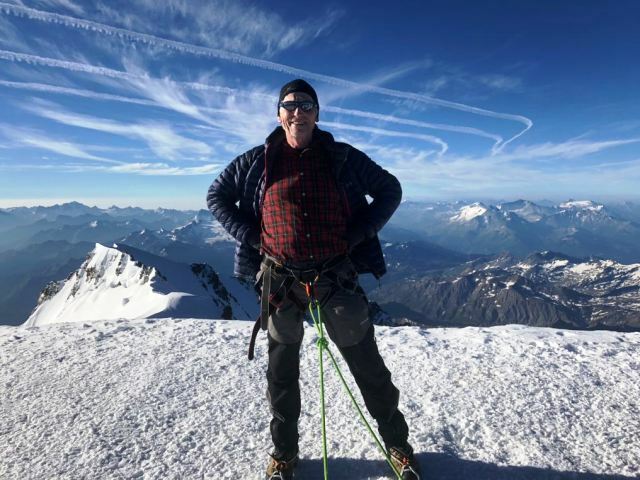 You can imagine my delight when a window of opportunity in the weather allowed a successful climb to the summit of Mont Blanc – and for someone like me (on the ‘wrong side of 50’) that was a real testiment to the guide’s ability, skill and patience. Thank you to all at ‘Mont Blanc Guides’ who allowed me to realise and achieve a 36 year dream I’ve had since my teenage years. I’m the happiest man in the world! Simon Dell. – The guides you work with are really experienced and nice! We climbed with Christian, Francis and Eric. Extremely safety conscious and really nice guys. They seemed to like working together and we liked climbing with them. – The chalet where we stayed was really nice. It moulded our group together quickly and the dinners and breakfasts we had there were long and filled with joking and retelling things that had happened on the mountain. – The tour: the first 3 days in themselves are worth a trip down to Chamo, with Aguille de Tour and Petite Fourche. I think you can “market” that more — I was really glad to have “bagged” two more nice peaks without even expecting it before I came down. I would really recommend you to anyone wanting to climb the mountain. I am sad you don’t do other trips as well because I would come back as a customer. I am actually a fan of the “do one thing and be the best at that” rather than offering the same standard menu of stuff as everybody else 🙂 Just a shame that there aren’t more on offer with the quality you guys have! Many thanks and best regards, Charlotte Laike. John, I just wanted to drop you a quick note to say a big thank you to you and your team, both on the mountain and in the office. I thoroughly enjoyed my time with MBG the week before last. We got lucky with the weather in the end but I appreciated all that you did in managing our expectations earlier in the week when it didn’t look so good. Personally I’d like to say thanks for your patience in getting the ‘Fat Ducks’ up to the top of hill – I know that you were probably wondering what we were doing some of the time ! It was a great all round week, you’ve got a great product and package there and I will have no problems in recommending you to fellow adventure travellers. I love the addition of the video to the website, it looks great and gives a real feel for the climb. Thanks once again, have a rest now before the snow comes and I’m sure I’ll bump into you in Cham again in one of the winter seasons. Take care, James. Once again I would like to repeat my comments to you and MBG about the standard of professionalism and care that your guides took with the group. In my case and 2 others,Marianne and Ben, they went that bit extra to ensure that all our group successfully summited. Ric, Miles and Big Neal in particular are a credit to your industry in this instance. Considering his recent paternal status,(and lack of sleep, never mind the celebrations)Small Neal was a hit with the SA boys, and the incessant chatter of Frances, and his views on life and the universe kept us all constantly amused. If I was asked to recommend a company to take a group of inexperienced mountaineers to Mont Blanc, I would have no hesitation in putting MBG at the top of the list, on the assumption that your careful selection of guides ensures the high standards presented. Kind regards, Rory. Dear John, James, George and I have now been home for a week and it is only now that the momentous events of our week in the mountains with you are settling down in some sort of order in my mind. I have been describing my week as one of emotional and physical highs and lows and, thanks to Yan’s and Graham’s fantastic support and encouragement, and endless patience too in Graham’s case, we can look back with great satisfaction on reaching the summit of Mont Blanc on such a perfect day on Thursday 24 July. We will treasure the memories of the week for years to come, especially the comradeship and humour amongst our group, and Graham’s absolute professionalism, support and encouragement which enabled me to succeed. So many, many thanks for a great week and a host of memories and, from Sara my wife, lots of thanks for getting us all home safely. I’m attaching a couple of pictures which encapsulate our week and which reflect our joy and relief at what you helped us achieve. With heartfelt thanks to you all, Julian, James and George. Hi John, I’m back home now with the family and wanted to thank you for one of the most memorable experience i’ve ever had. 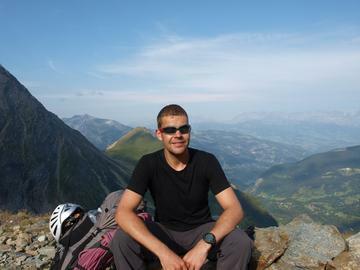 You’re passion and knowledge of mountaineering and especially the Mont Blanc massif is incredible. The guides (especially Francis & Michael) were fantastic and were highly regarded throughout the group. 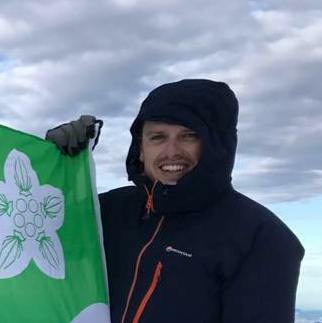 I must admit that I had many moments of doubt throughout the week and on summit day that I would actually make it, but with encouragement from you, Francis and other group members I am so pleased to be able to say I made it! I would highly recommend Mont Blanc Guides to anyone considering embarking on this wonderful experience and I’m happy for you give my email or mobile number to anyone wanting to ask questions before booking with you. Take care, Elliot. John, what an awesome week. You employ the services of some seriously skilled guides. I learned so many new skills and so much about myself. Just goes to show that life goes on after reaching fifty. Thanks especially to Dave “Hollowfinger” Hollinger who wasn’t afraid to give me a kick in the pants when it was needed. If I had a message to pass on to other potential clients I would say yes it’s important to focus on achieving your goal of climbing the Mont Blanc but if it doesn’t happen don’t be disappointed. You are first and foremost going to enter a different world regardless of what peak you end up climbing. A true simple world where basics matter, a mouthful of water, a piece of chocolate, a halt, a smile of encouragement. You’ll gain an experience that will stay with you for the rest of your life. Great trip. Great organisation. Well done. Mont Blanc Guides do not just move the goal posts they hide them in a place where no one else has shown interest in reaching. Like I said on Friday I have some unfinished business….. Best regards, Ken Welsh. Dear John, apologises for the delay but just about up to speed with the joys of office work. Thank you for a fantastic week and for a safe ascent (and descent) of Mont Blanc. I think I even got used to staying in the huts by the end (its all a frame of mind). The guides you employed were brilliant characters who all added to the enjoyment of the event. Accommodation at Skiers lodge was luxury after the huts! Best wishes to you and Claire, with kind regards Clive. Hi John, amazing how time rushes past – just realised it’s over 2 weeks since I got home and I’d been meaning to get in touch. Really just wanted to say thank you for a fantastic holiday. 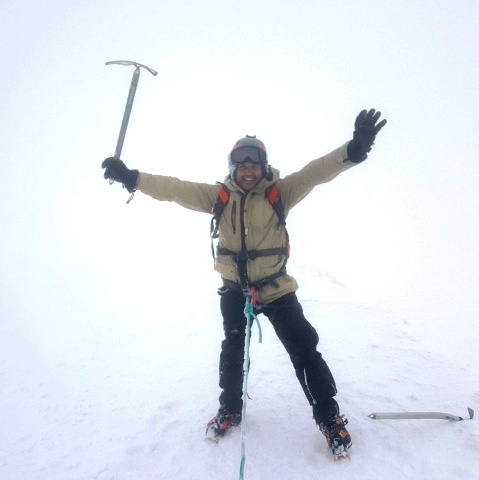 I really enjoyed both the ‘training’ and the Mont Blanc climb (perhaps despite appearances!) and thought the guides and also the logistics were great – the chalet is a beautiful base for the trip and the training route seemed to work really well. Your insight and knowledge about altitude sickness was really helpful and I will always remember you telling me to just keep breathing! Anyway, it looks like you’ve got a great setup and I really enjoyed it – as I know all the family did. Best wishes, Clare. Dear John, thank you for a brilliant week. Your professionalism, organisation and enthusiasm all made for an unforgettable experience. It really showed how much time and effort you have put in to getting the Mont Blanc trip right – from the accommodation in Les Houches, the shop you recommended for boot hire and the guides you use through to the effectiveness of the training and acclimatisation days and the timing of the summit attempt to avoid the crowds and get a better night’s rest. 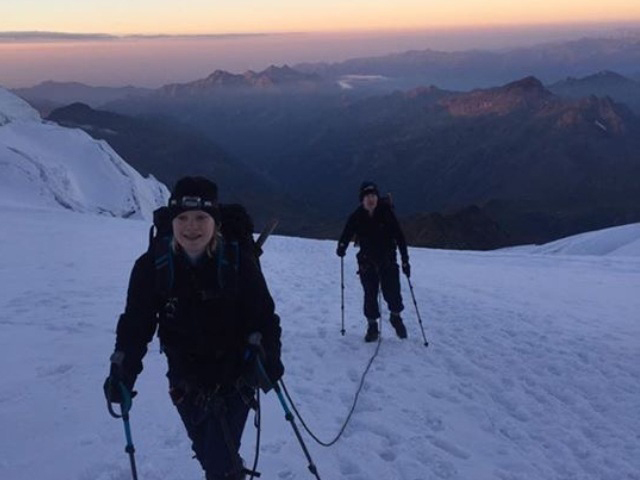 Whilst I, like many, was interested in climbing Mont Blanc, the peaks we climbed on the first few days were also really rewarding as well as being fantastic training. 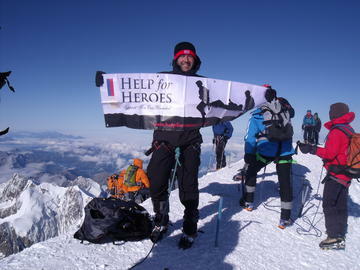 And on Mont Blanc itself I very much appreciated all your encouragement and support in helping me reach the summit. The spectacular views from the top are something I will never forget. 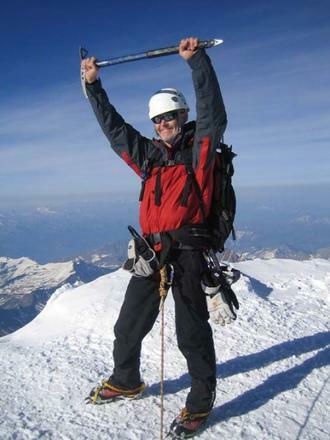 I would unreservedly recommend Mont Blanc Guides to anyone who is thinking of climbing Mont Blanc. Please do feel free to use any of the above in advertising. All the best and good luck for the rest of the season. Cheers, Mark. 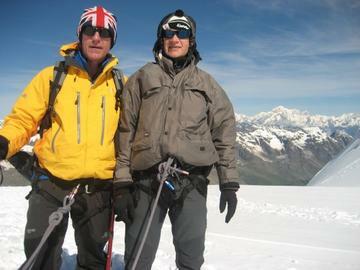 John, we may not have been able to climb Mont Blanc last week but I had a fantastic time. Really impressed with the organisation, professionalism and the friendliness of the guides. 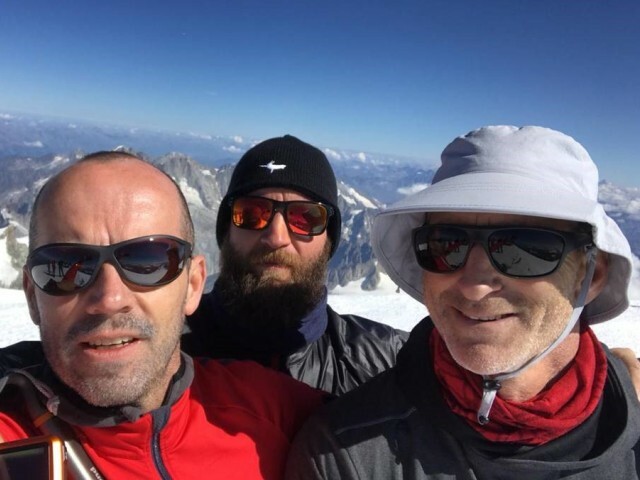 Although the weather thwarted us it was great how John, Oli and Lionel quickly created an alternative programme – completing the Cosmiques Arete felt as good as climbing Mont Blanc. Thanks for a really memorable week …. yes I’ll be back. Best regards Eric. Hello John, I was on last weeks trip, and just wanted to drop a line saying thank you for organising such a great week. The guides were brilliant, in particular John and Lionel who I seemed to link up with most. I felt ‘safe’ all week, and managed to do many things that my confidence would usually stop me attempting. A job really well done, very professional, and great fun. Hope to return next year, and get to the top, it’s the only photo tht is missing! Due to an unusually large amount of snowfall we were unable to attempt Mont Blanc. The snow conditions were very treacherous (especially the Grand Couloir) and so after discussions with the guides we were given the option to climb up to the Tete Rousse hut and have a closer look at the conditions or to use the day to do find some alternative activities.The guides were really helpful in advising us to make a rational decision about the climb and, although we were very disappointed not to have the chance to give Mt Blanc a proper attempt, we felt we were given very good advice on the pros and cons of the options and also a very clear analysis of the safety aspects of the route. John was very good in rearranging our schedule to make the most of the remaining four days we had. He was able to book as all in to the Vittorio Emanuele hut on Gran Paradiso (the highest mountain in Italy at 4,061m) and we had two superb days climbing that peak (and if anyone thinks it isn’t a challenge we met Kenton Cool doing the same thing with his clients!). The G.P. is a super climb and the vertical ascent is comparable with Mt Blanc as you start from around 1,900m. The final ridge (see photo) is pretty spectacular and the views form the top are great – looking across to the Matterhorn and back to Mt Blanc itself. The other highlight of the week was spending Friday climbing the Arete des Cosmiques (which leads up to the cable car station on the Aiguille du Midi). This was snow covered rock and more technical than Gran Paradiso and gave us a first insight into developing some more climbing skills. So, while we did fail in our main aim of climbing Mont Blanc due to the weather, the week was a great success and we all came away feeling we had probably had a more varied and rewarding week in many ways. The diversity of the activities that John and the guides were able to arrange at such late notice was superb. 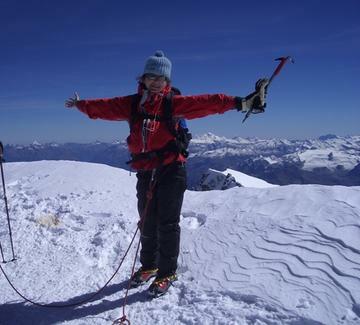 Oh….and we need to go back and do Mt Blanc at some point! Hi John, please pass on our sincere thanks to Matthieu, Simon and Dave for being such excellent guides throughout a fantastic week. We were well looked after, treated with real professionalism and had a great time despite conditions being too dangerous to attempt Mt Blanc. I think it was Chris Bonnington who said that the difference between those who get to the top of Everest (eventually!) and those who don’t is that those who succede do so because they know when to turn round. For anyone questioning whether or not to do Mont Blanc in dodgy conditions I would urge you to leave behind your ambition for one mountain and listen to the guides. They know what they’re talking about and wouldn’t have this conversation with you unless it were necessary. Gran Paradiso is not Mont Blanc but the views were awesome. As for me I’d rather a week of Cosmiques ridge stuff any day over plodding up a snow field so if the chance comes grab it with both hands; you can always come back another year for the big one. Thanks again for a great week which we will recommend to others. Perhaps we’ll be back next year?! Regards, Tim. 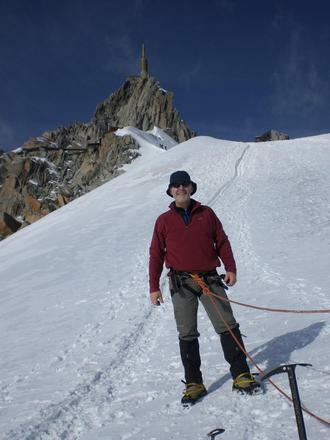 John, Just to say a big thank you for your leadership and instruction during our week in Chamonix , and especially for our climb up Mont Blanc . It was all round an exhilarating experience with some lows and many highs, all the time with one aim in mind – and we all made it! I hope that SA John has fully recovered after his arduous descent – a tribute to his strength and will power that he got back to the hut whilst feeling so ill. I thought the set up of the training, your instruction and coaching throughout, and your handling of the difficulties up the mountain were all excellent and a reflection of your own rigorous training and deep experience. 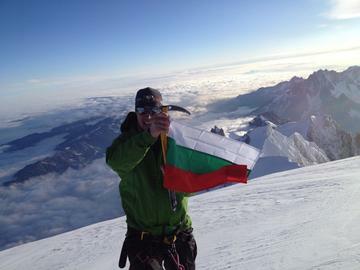 So, thank you, and I will certainly recommend others who wish to climb to go with Mont Blanc Guides! All the best (you have probably been back up there again already!). God bless, Peter. John, Just a short note to say thanks for the great trip we had last week. I know from talking to the boys that we really enjoyed the time and patience shown by you and the rest of your guides. I’m definitely going to be recommending you to a few other people so I look forward to receiving some commission! On a personal note, I’d like to take the opportunity to single out Rick for the patience he showed in getting myself and Espen up and down when we were both feeling pretty shattered. Cheers, Sanj. 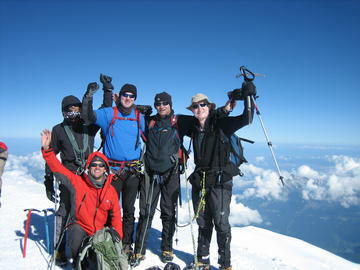 I and 3 others successfully summited Mt Blanc under the capable tutelage of Mt Blanc Guides, (guided by John Taylor). 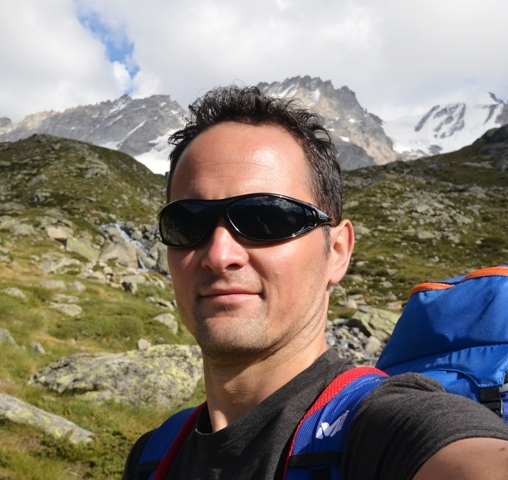 Some questions you might be asking… Did you feel safe with Mt Blanc Guides? Absolutely. Did you feel you got value for money? Absolutely. Is Mt Blanc dangerous? I guess risks can’t be totally eliminated but I really didn’t feel uneasy or unsafe with JT around – being a guide, he comes seriously qualified. The bottom line is your life is his future so he’s not going to muck around. How fit do you really need to be? My experience (one climb!) suggests Mt Blanc is about endurance. Try running a couple of miles in wet sand, non-stop. Speed isn’t important. If you can do that, my guess is you should be physically able to summit. 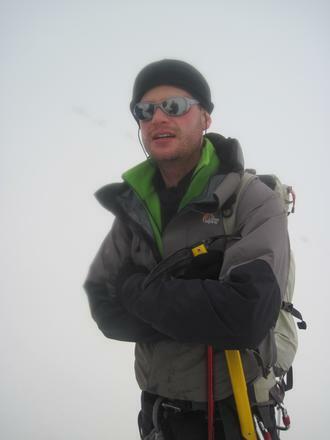 JT paces you well and can bring in other guides to split a group up if needs be. What about hiring kit? Its cheaper than buying, kit is readily available and even with boots, it really isn’t an issue. What about food? Its good – no complaints whether in the valley or in the huts. Would you recommend Mt Blanc Guides? Unreservedly. JT’s justifiably proud of his qualifications and expertise and an engaging bloke to boot. 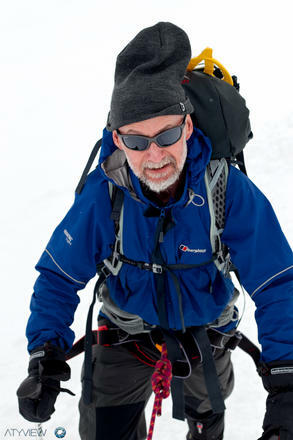 You might just need to remind him to bring his pack!” Tim Robinson. Well, what a great week! – truly uplifting, and what a fine bunch to do it all with. Thanks to you all for making it such an enjoyable and memorable experience. 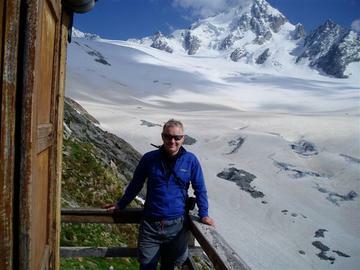 John, particular thanks to you for your expertise and good judgement, and yes, here comes the endorsement!… ‘I couldn’t imagine a finer Mont Blanc experience’…there we are – it’s official now, so feel free to quote me. Richard Erin. Hi John, Just a quick note to say thank you again for what was a really great week. I was really impressed with the set up, the professionalism, and the laughs we had from day one. I definitely wouldn’t have got to the top had you not pushed me along (and also supplied the music!) – I really appreciated your support and patience, I know I was somewhat high maintenance from time to time! Anyway, hope you have a great week with your next group and may well see you again in Chamonix next year. All the best to the rest of the guides. Best regards, Karen. John, Had a brilliant time with you and your team last week, and chuffed most of the boys made it. It is all the guys have been talking about and we are talking about next years challenge (do you think we could handle the Matterhorn ?) Hope to see you again soon and we will send some of our best photos for you to use in publicity material if you wish. I am happy to deliver a glowing testimonial to any potential customers if that helps. Thanks again, Alan. 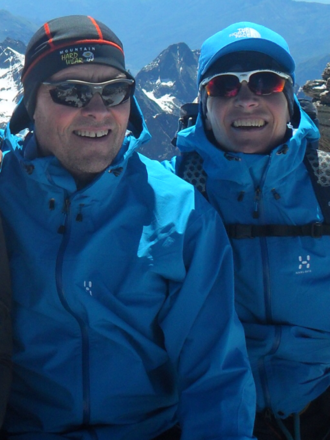 Hi John, just wanted to drop you a line to thank you and Cathy for the hard work you put in to get us up Mont Blanc and especially for the opportunity to do the traverse. I had a great time. The accommodation, training and guiding was all of a very high quality. Thanks again for helping me to achieve one of my goals on my “Things to do before I die” list. Neil (are we there yet…) Taylor . 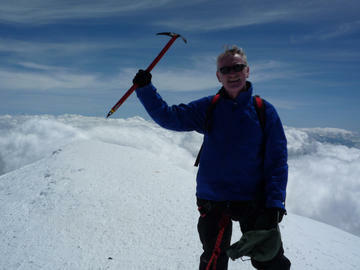 Had a great time John, enjoyed the three summits traverse, was a fine fine day. You’re doing a fine job! (please send a cheque for ?100000000000 made payable to “unbelievable complements.co.uk”) ha ha. Best regards Tony. If you’re ever in the London area give me a shout and I’ll organise Geoff and Tapper for a drink…and maybe a quiet sing song?? Remember my offer, I’m happy to receive a call from any interested parties to talk them through what its all about and give them the “client’s perspective”. I hope the business goes well-you’ve got a great product. All the best, Andy. John, thanks for such a great week and for all you did to make it a week to remember. Cheers, Mike.